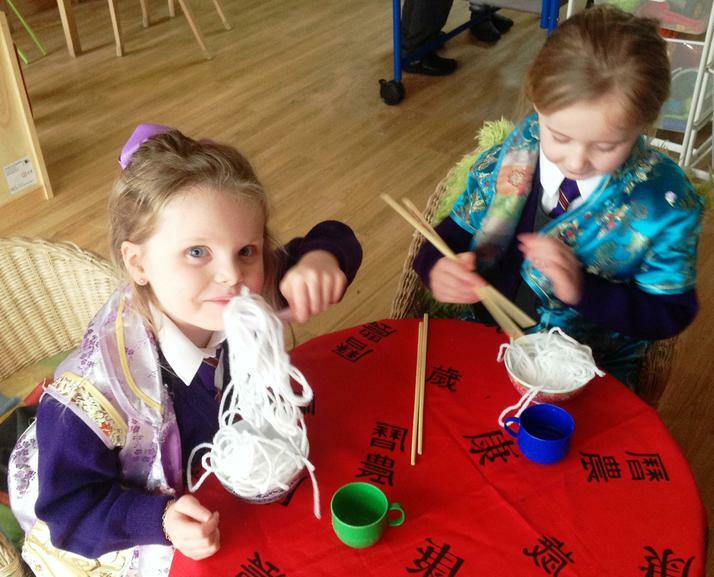 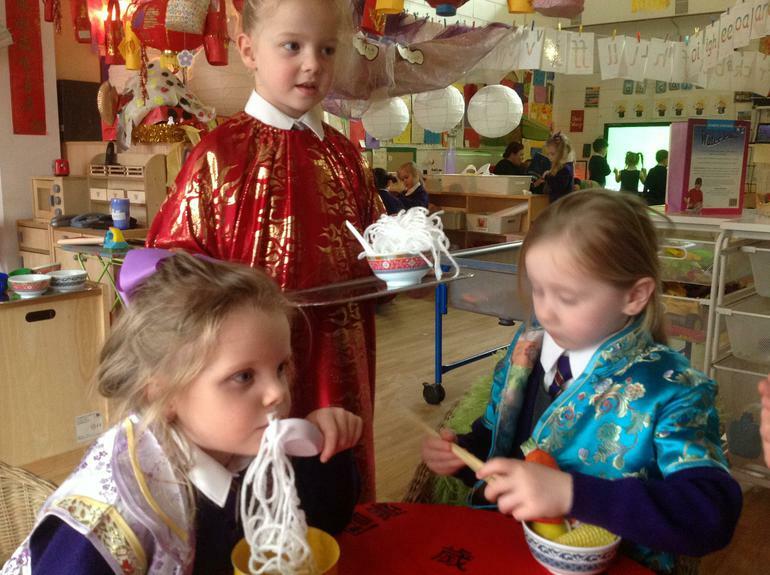 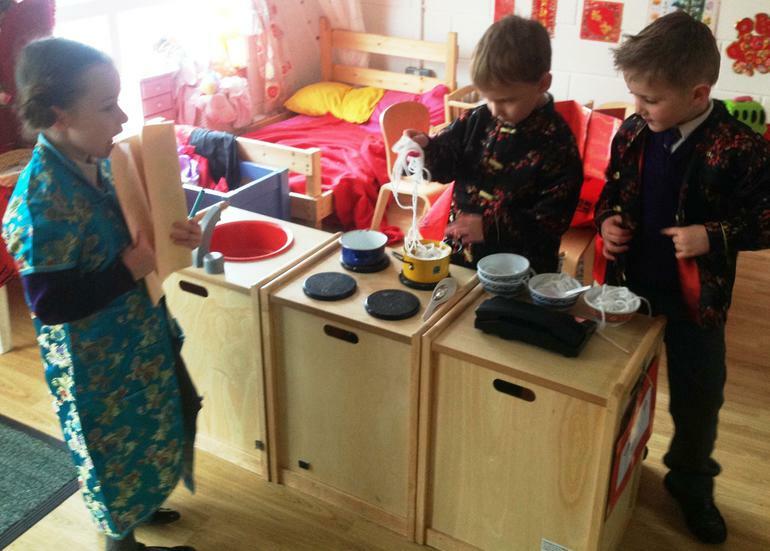 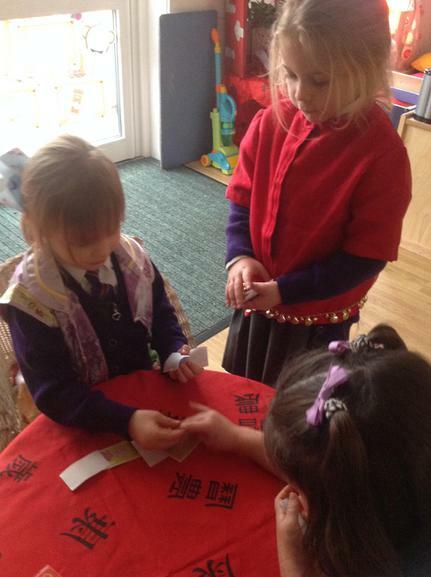 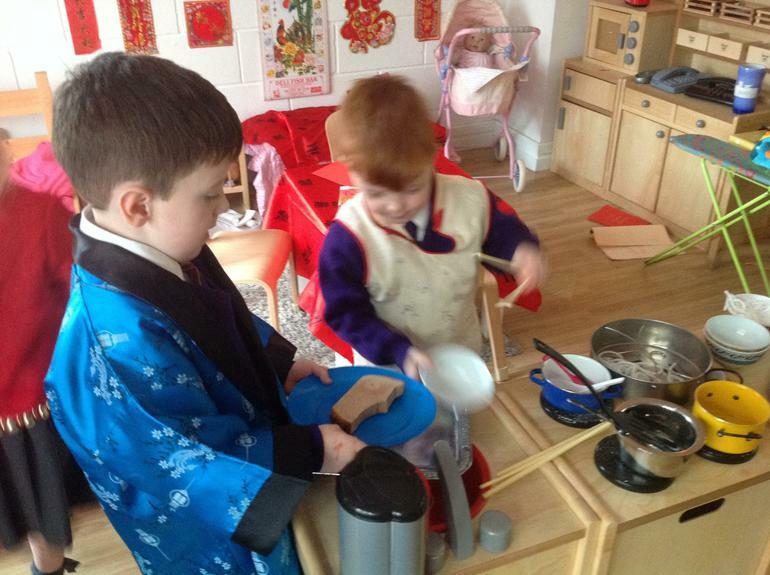 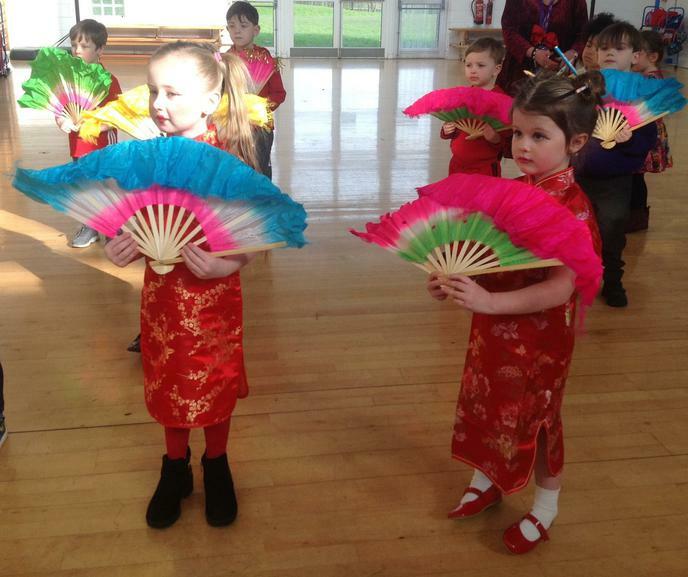 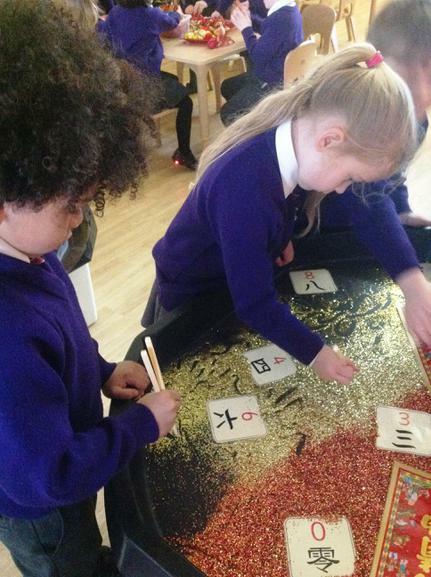 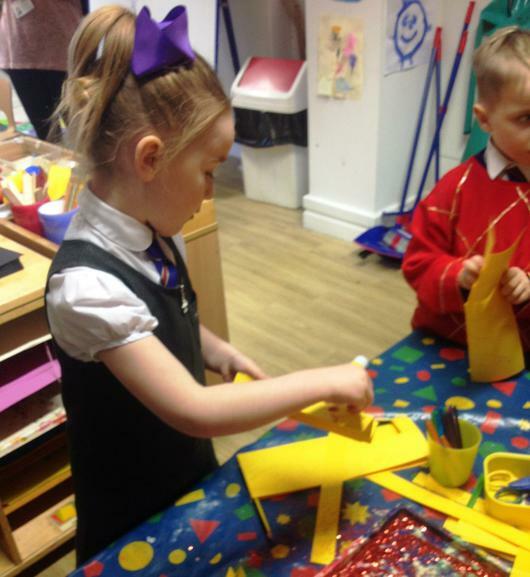 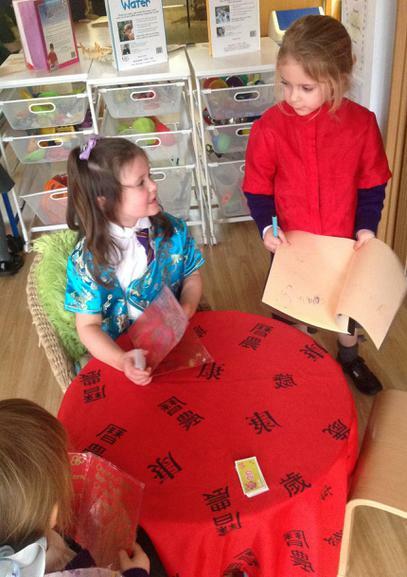 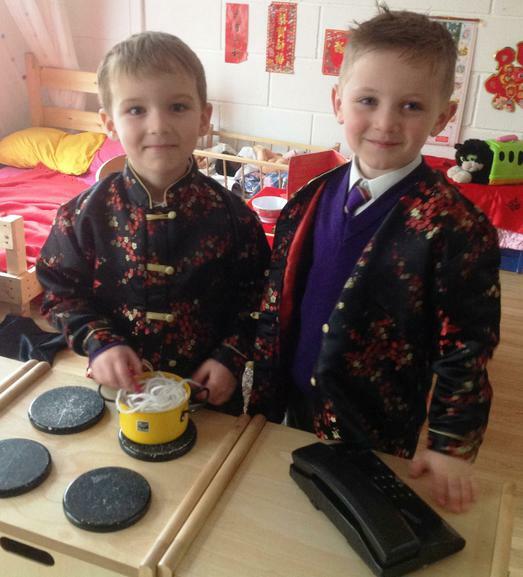 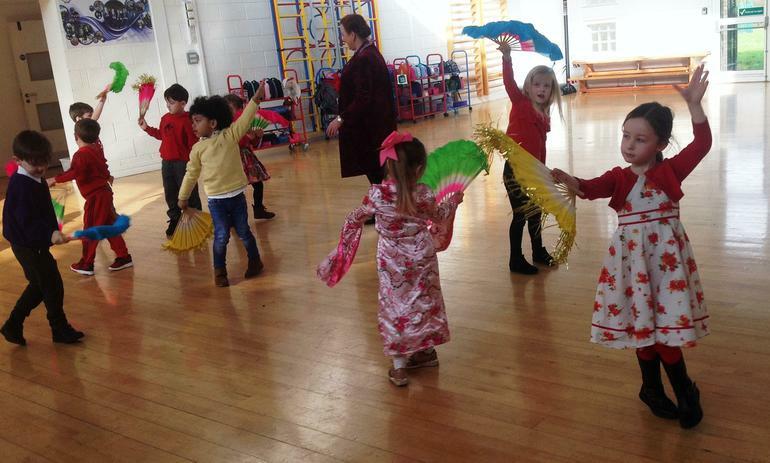 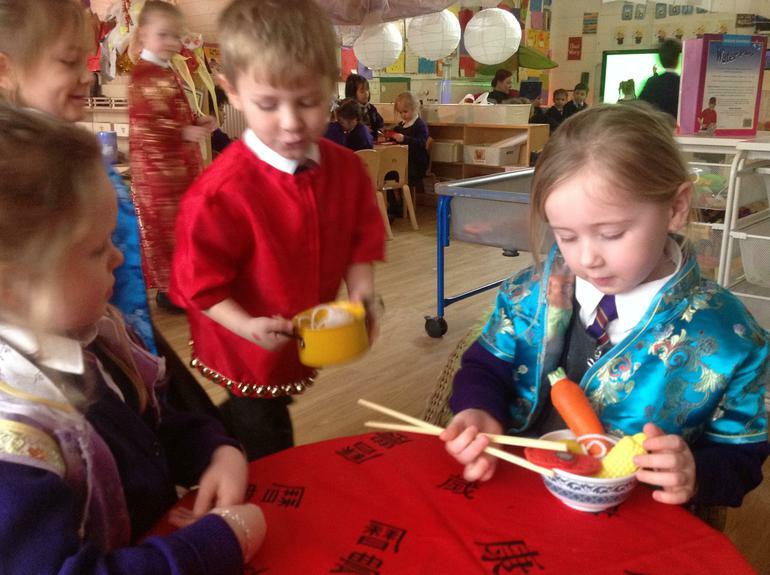 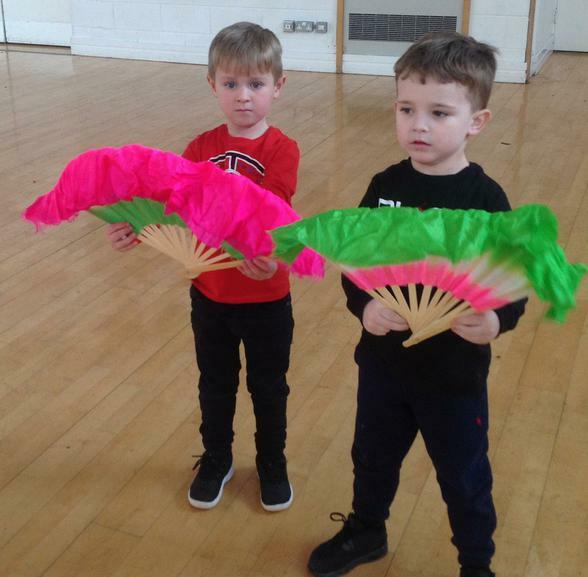 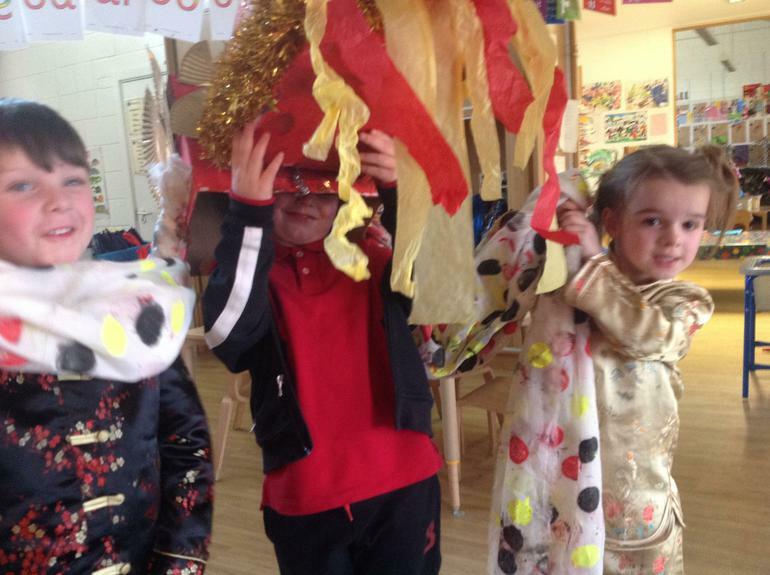 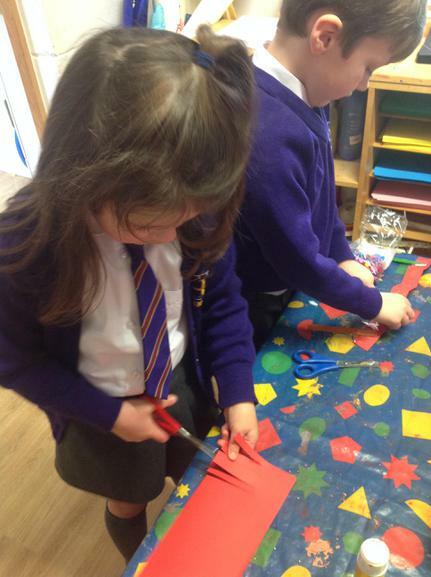 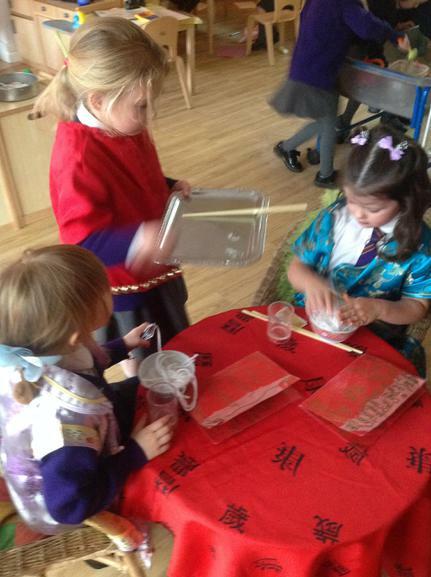 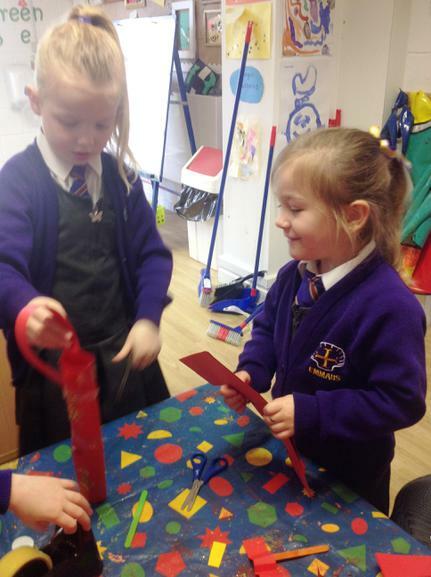 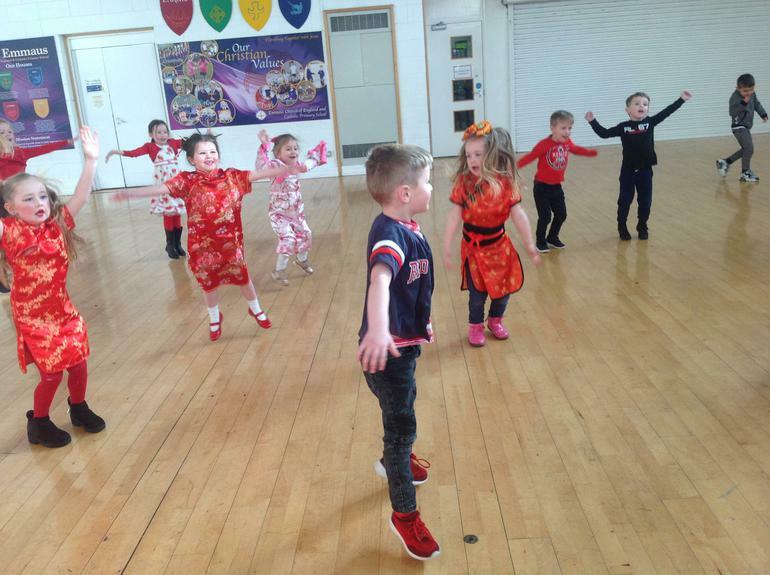 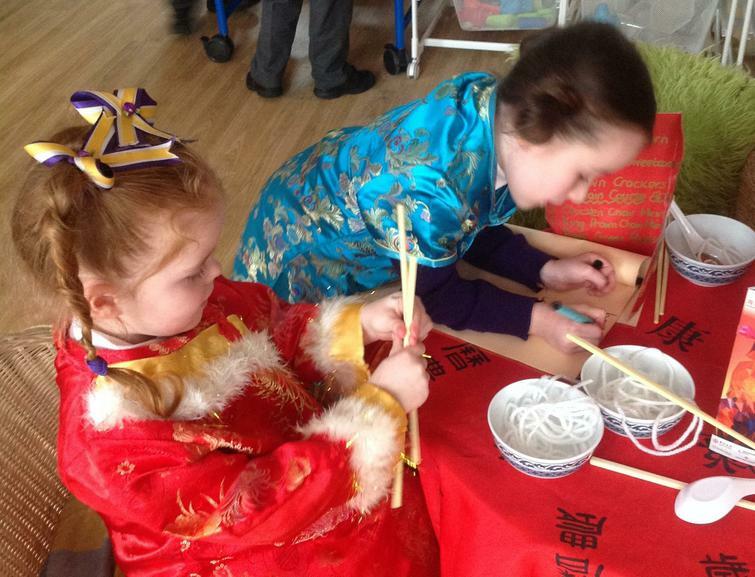 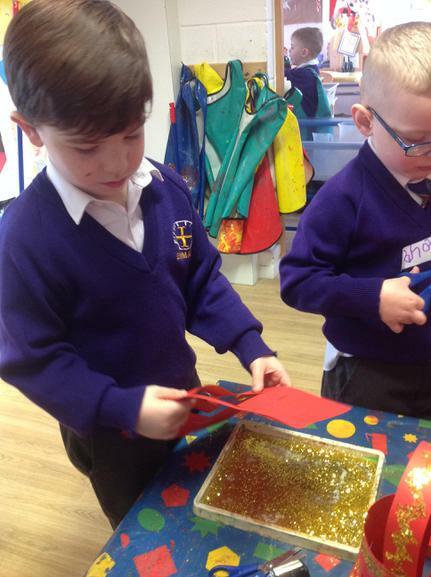 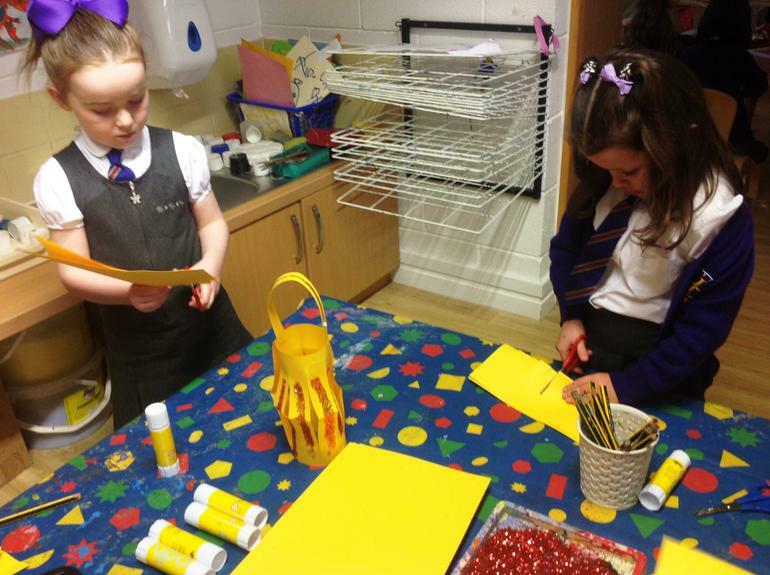 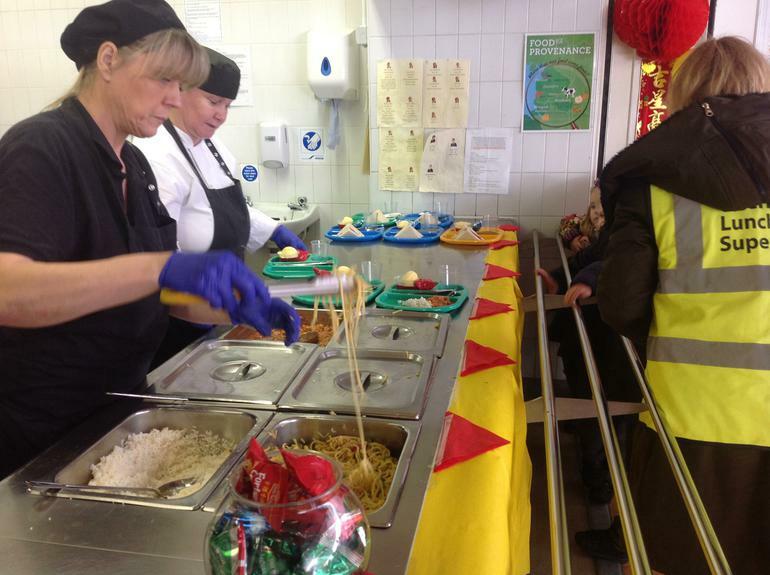 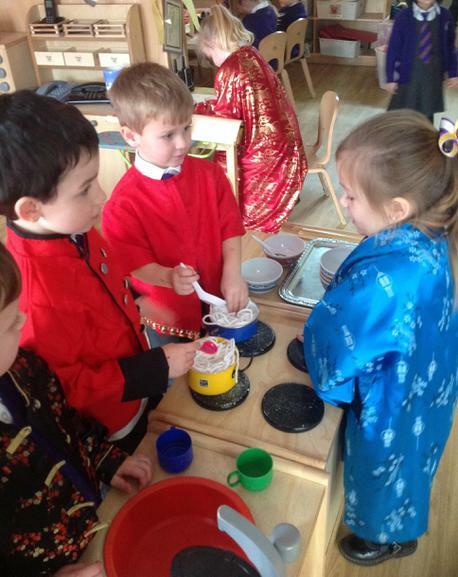 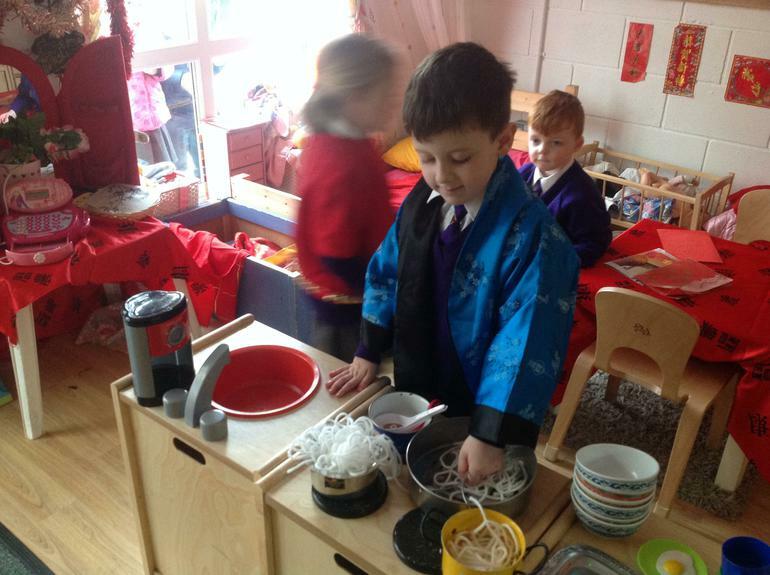 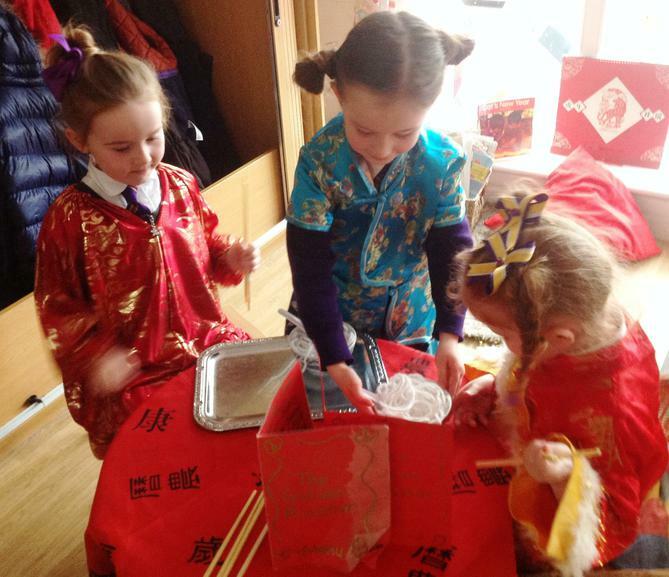 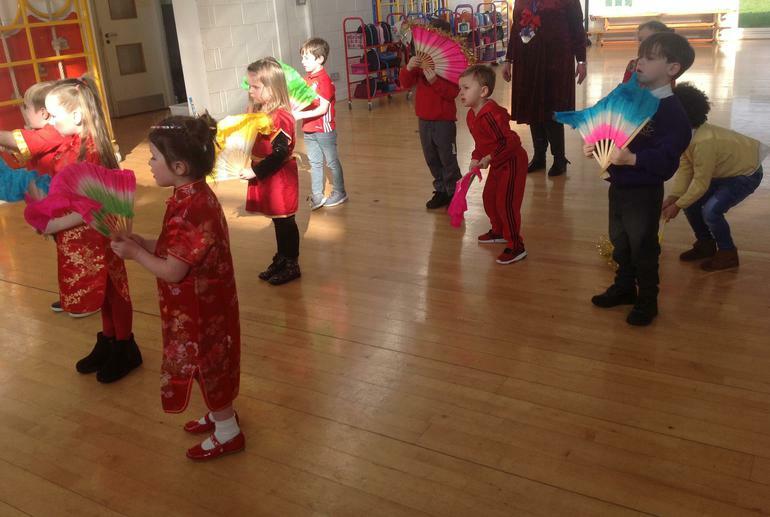 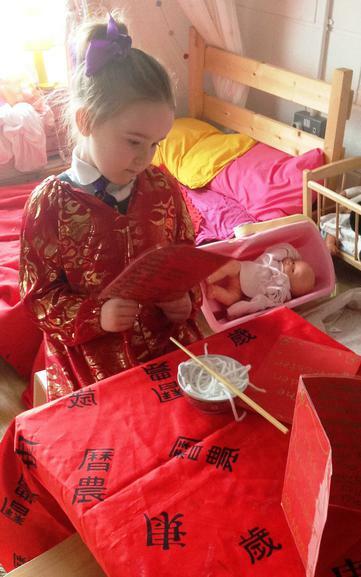 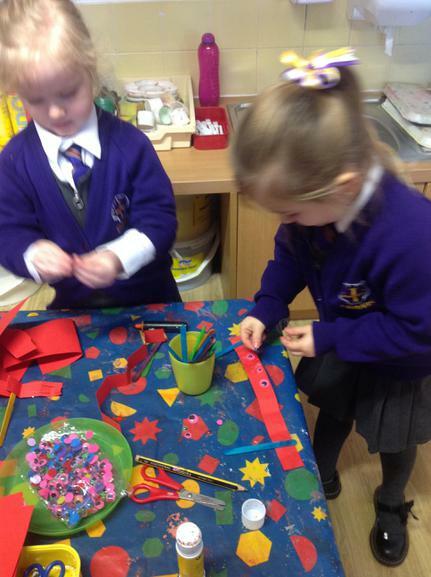 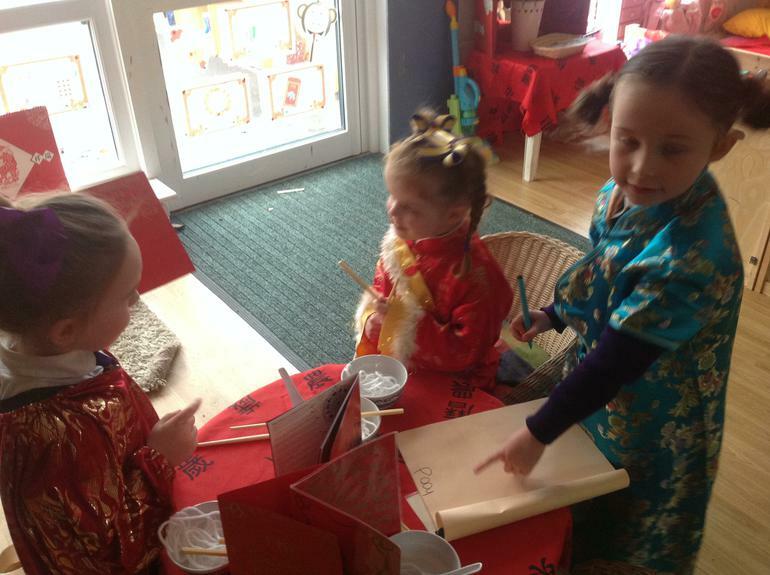 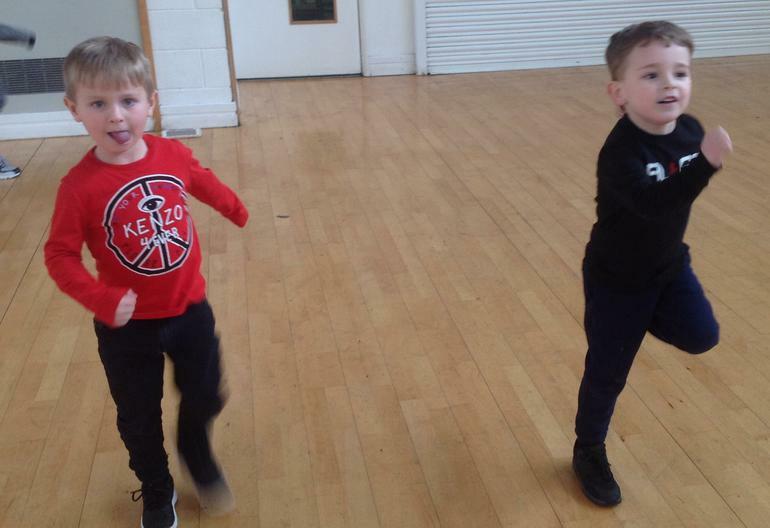 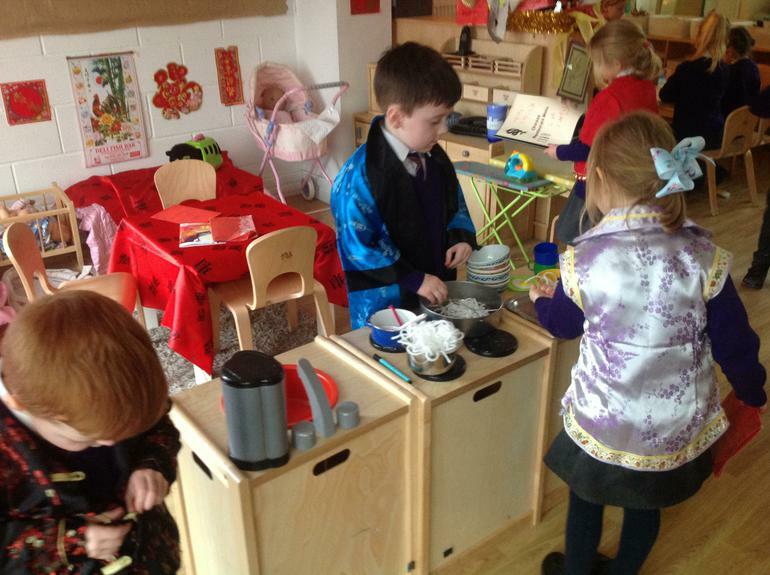 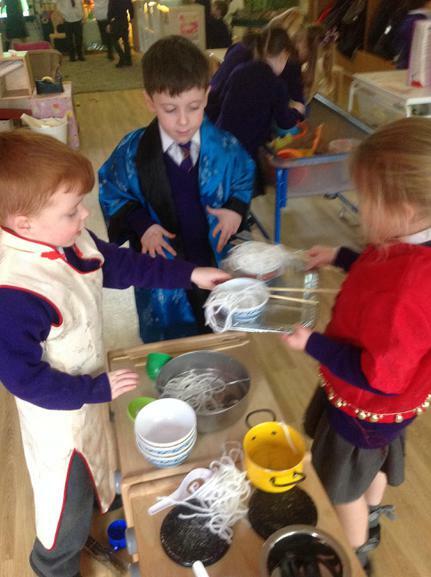 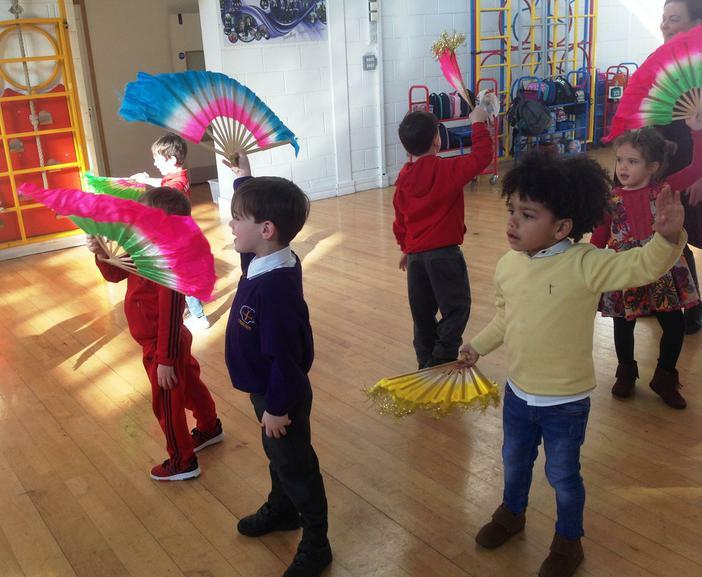 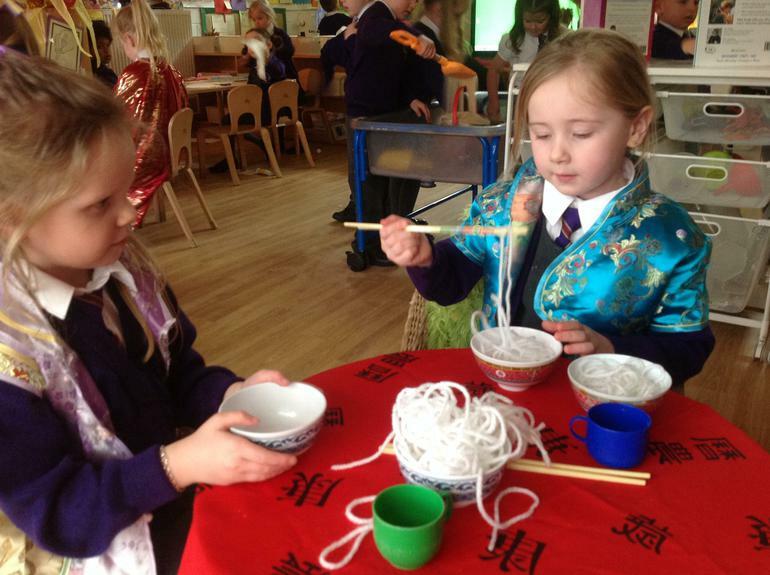 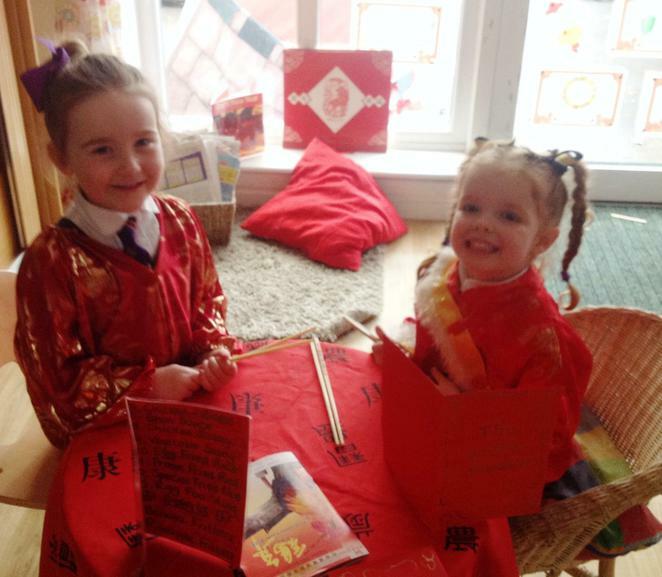 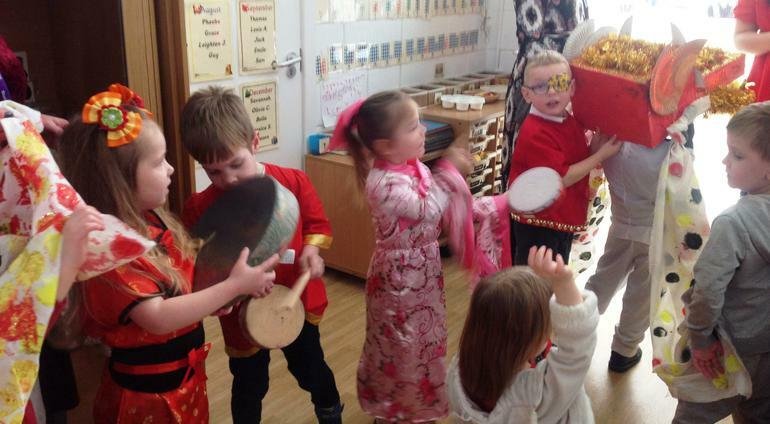 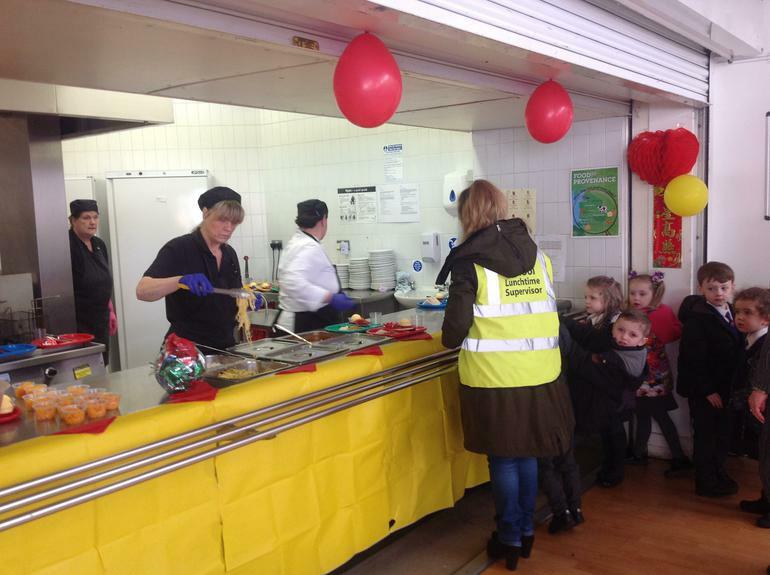 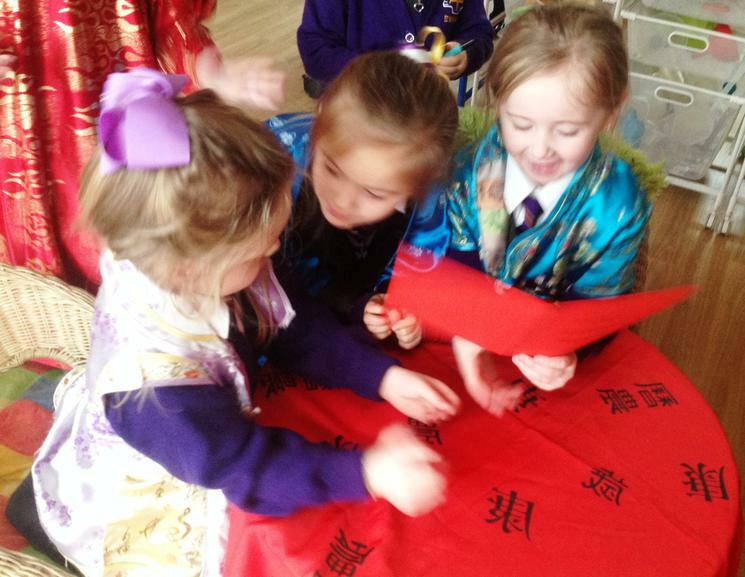 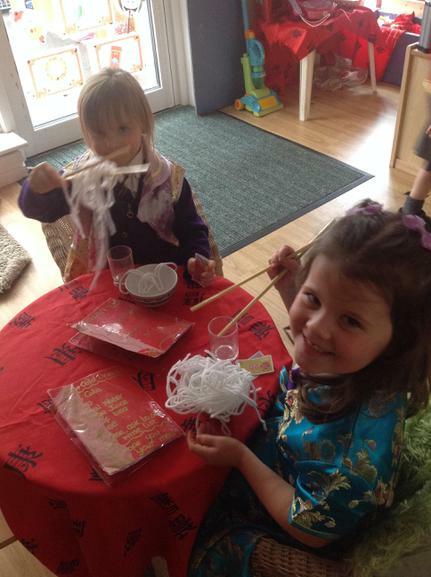 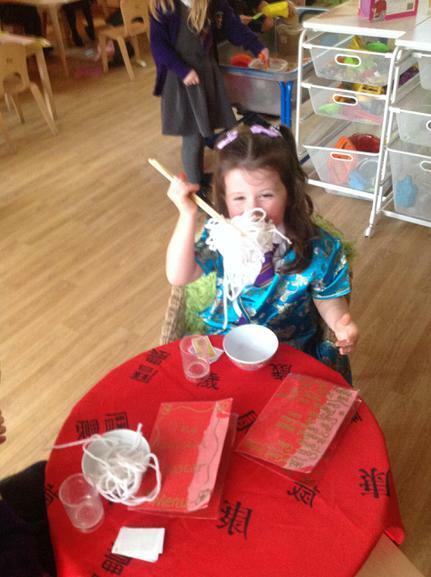 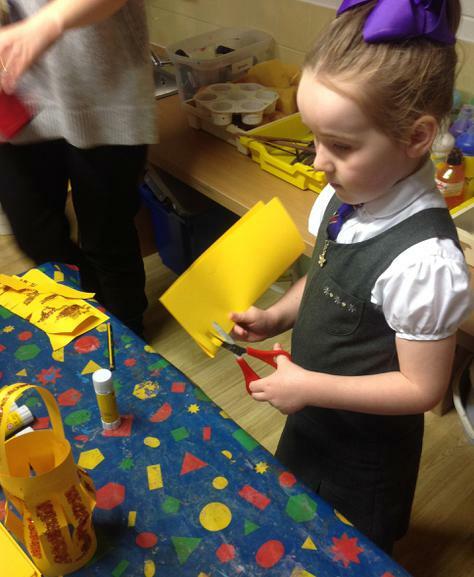 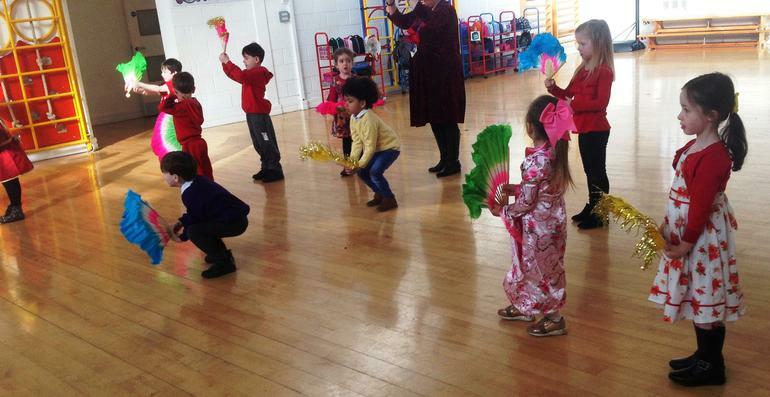 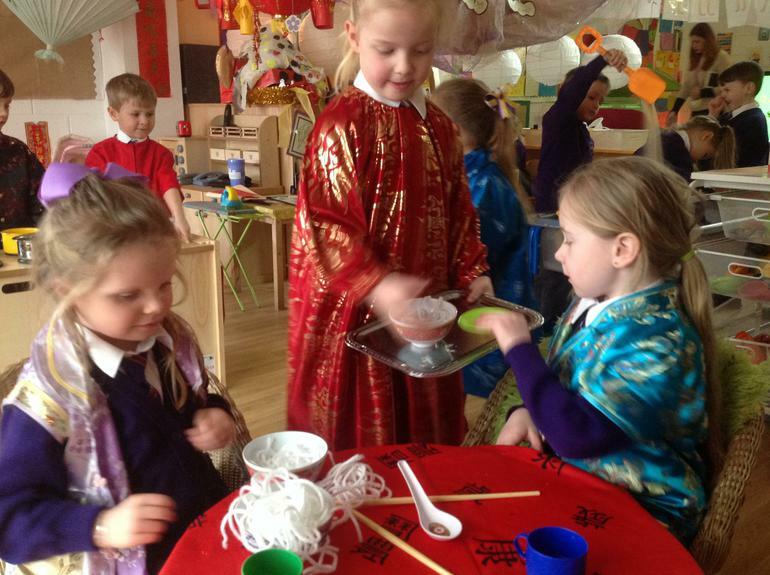 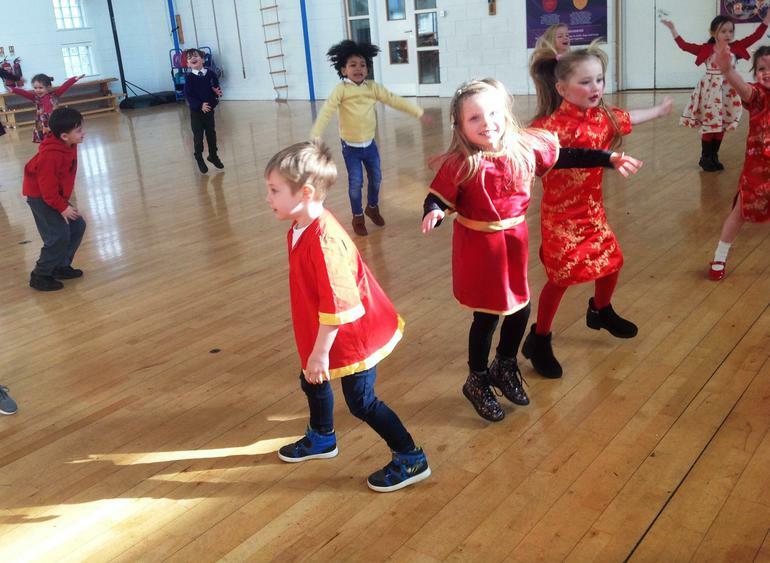 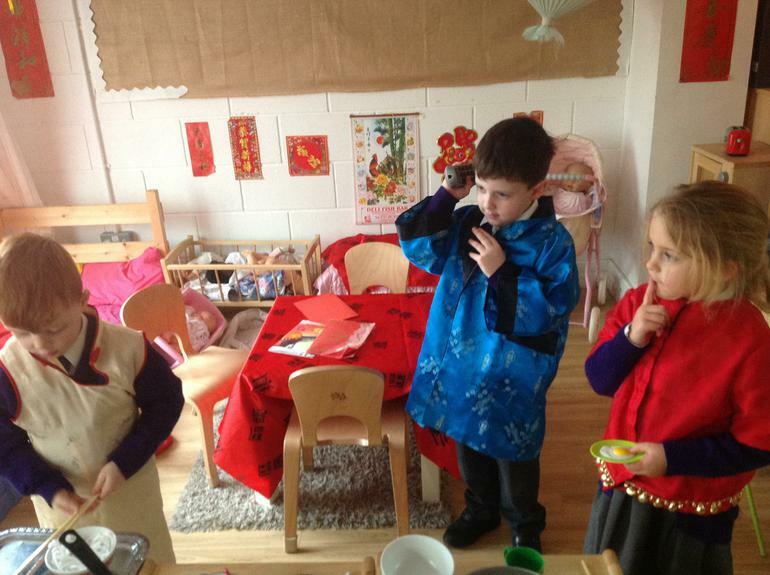 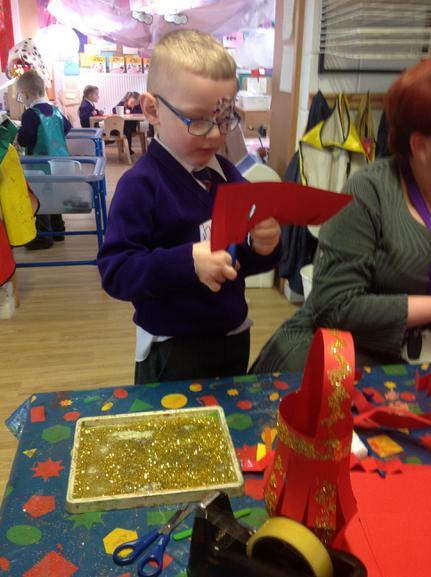 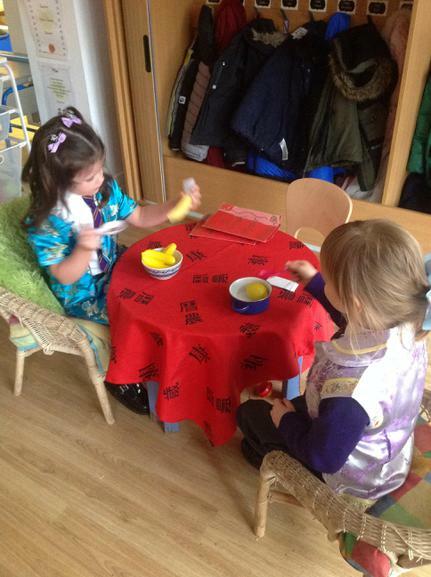 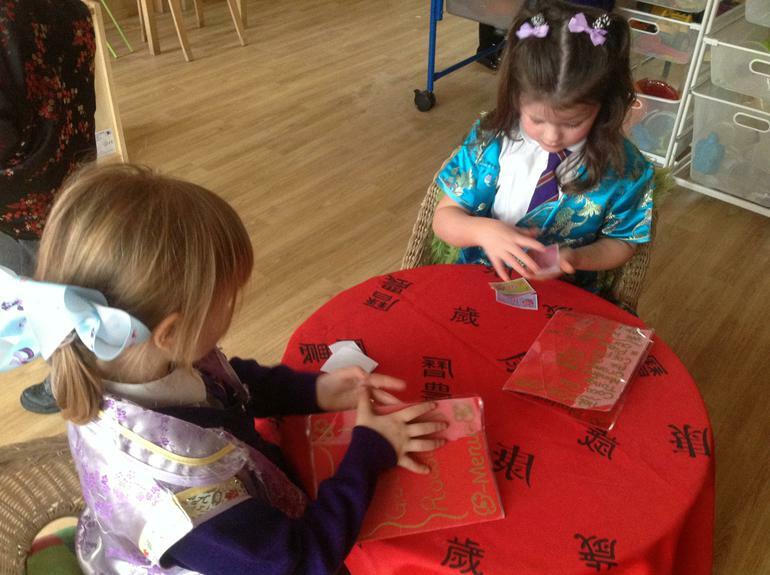 We celebrated the beginning of the ‘Year of the Dog’ making decorations and dressing up in our Chinese Restaurant role play area. 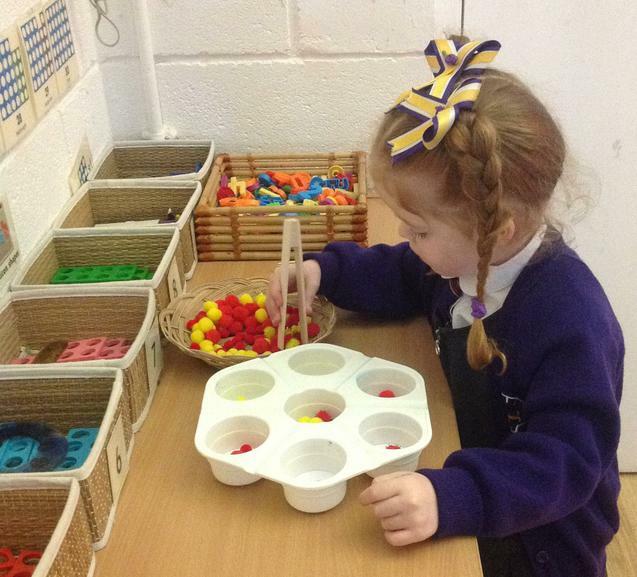 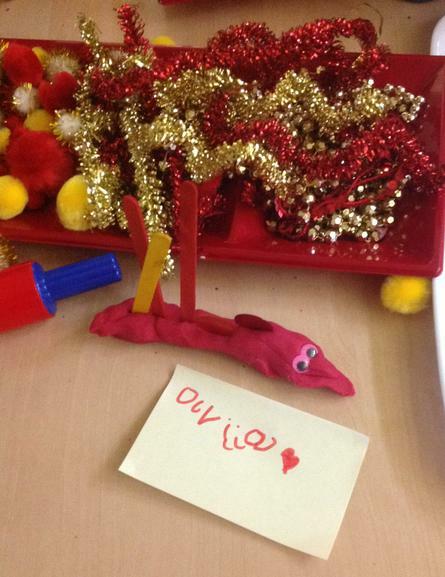 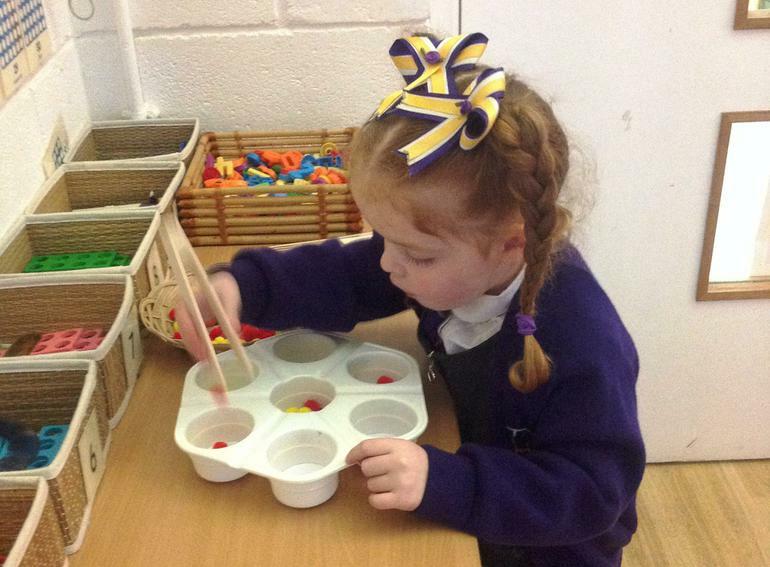 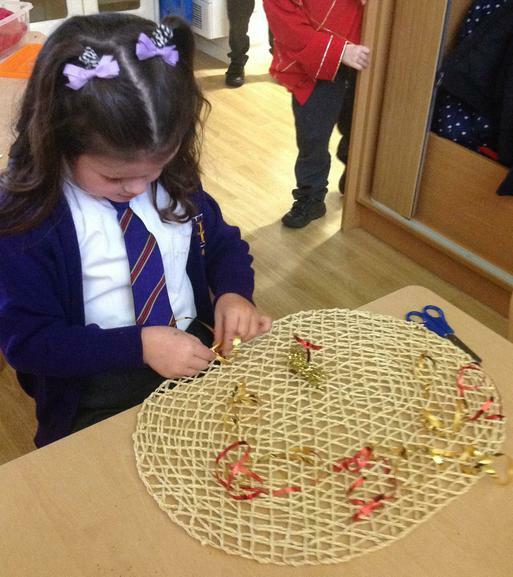 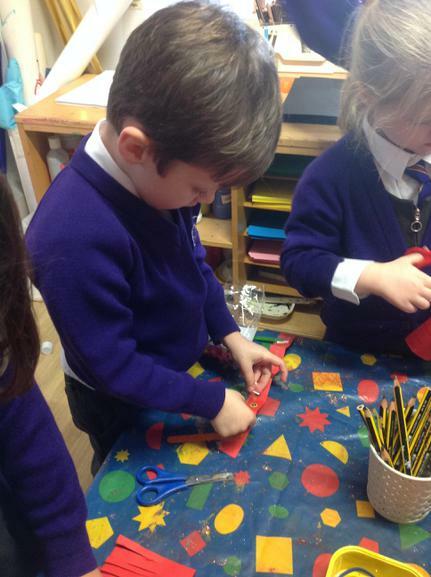 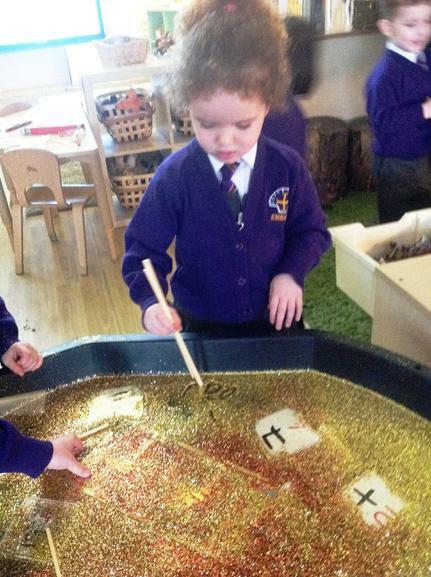 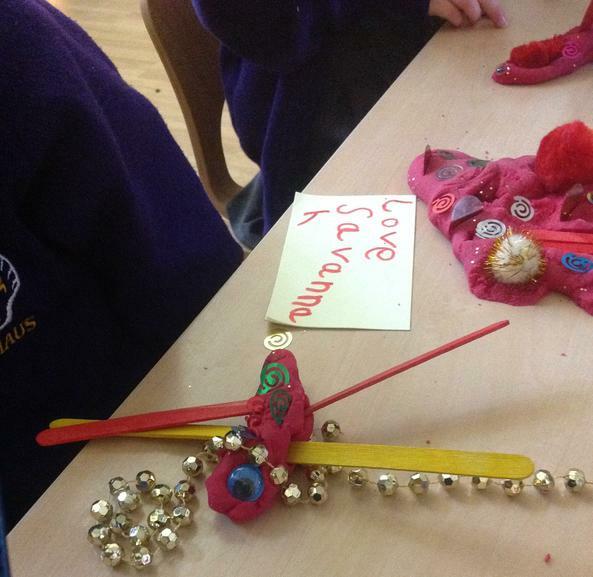 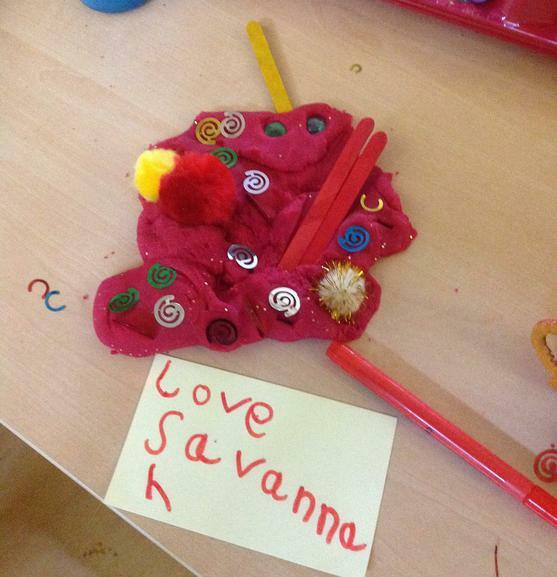 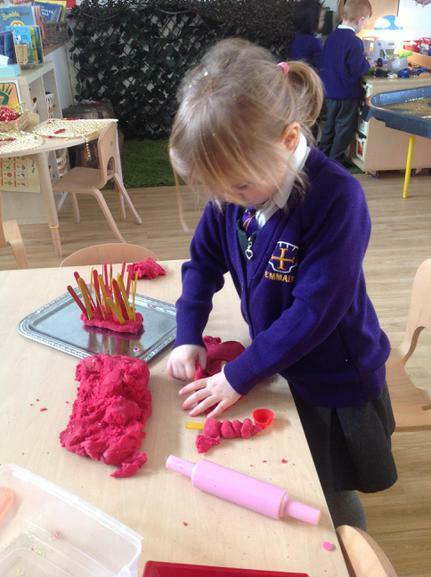 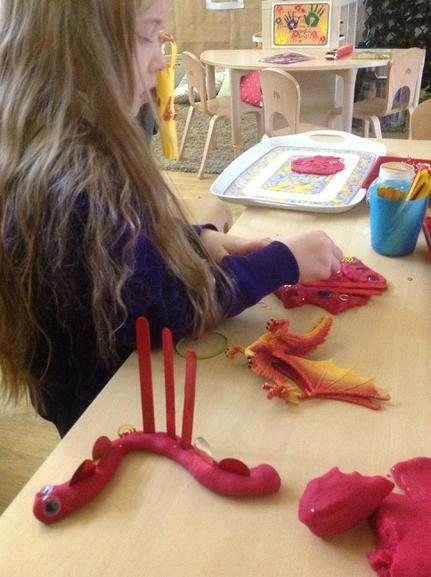 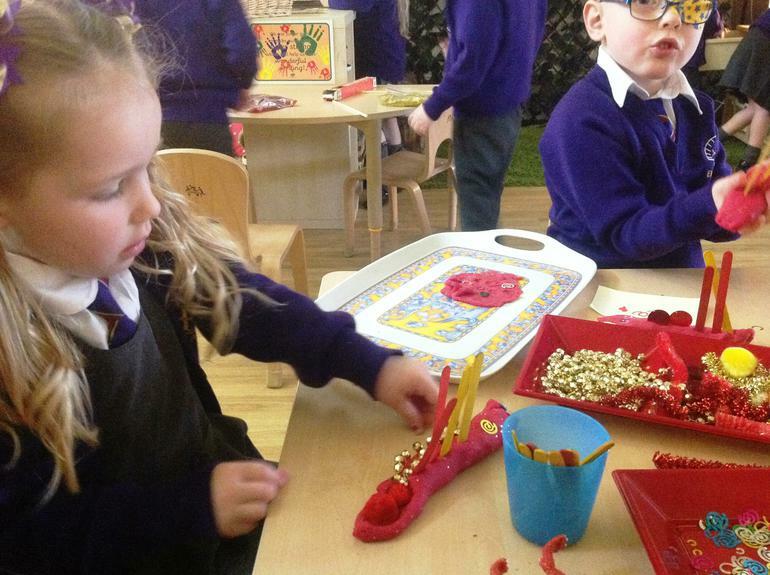 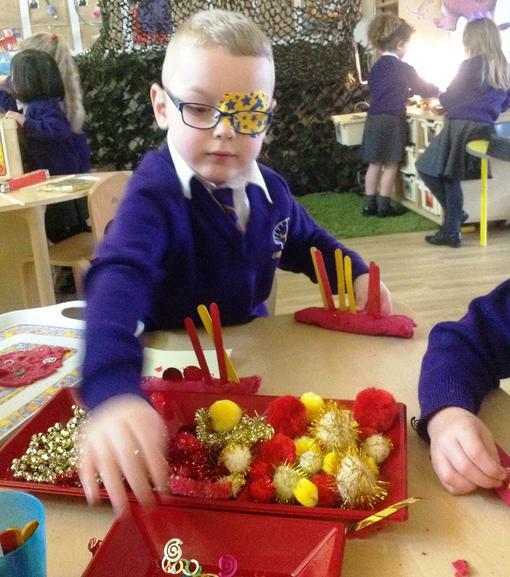 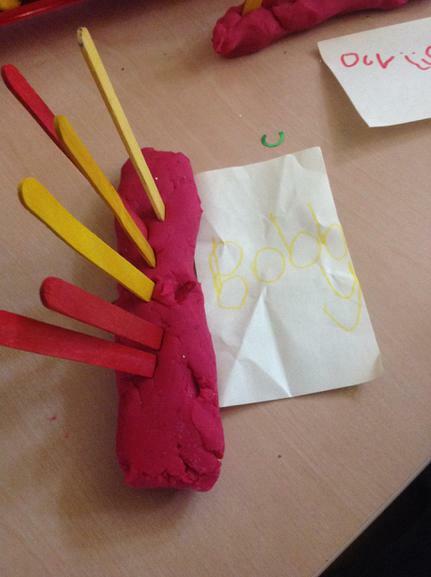 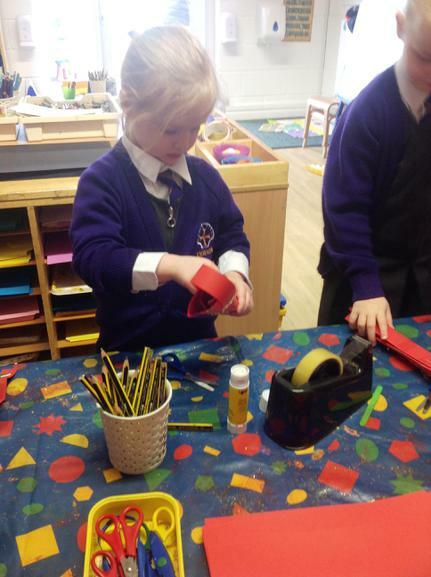 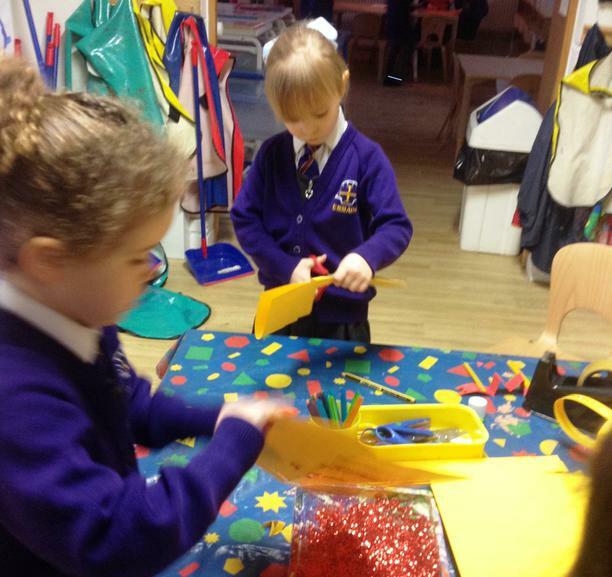 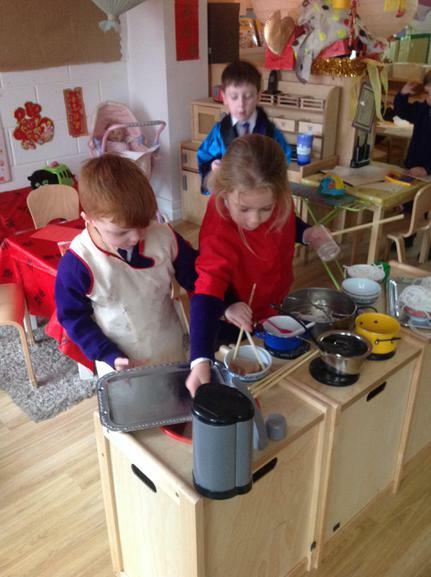 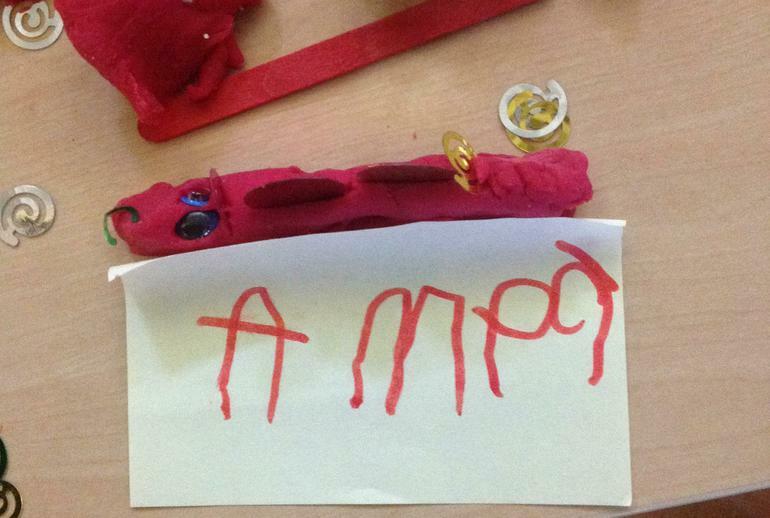 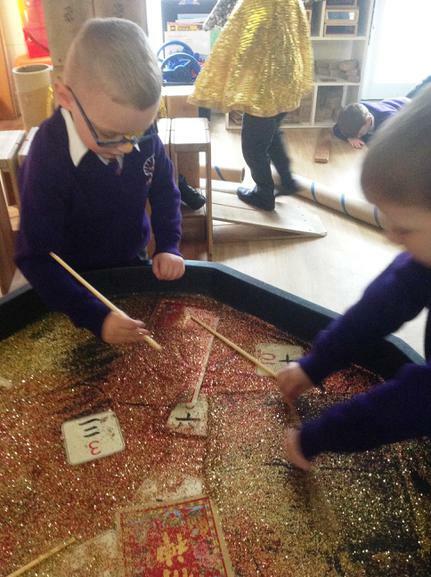 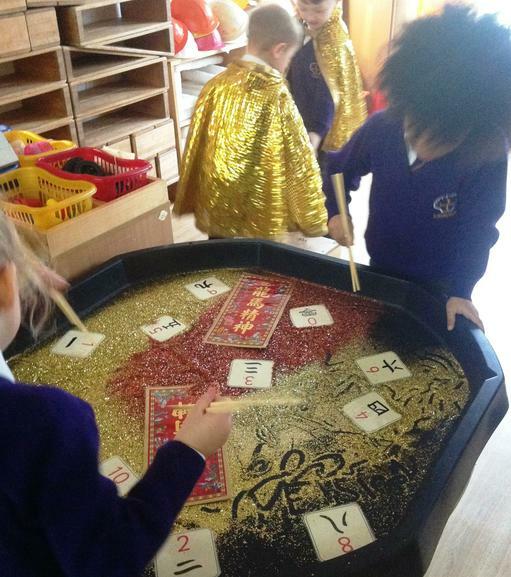 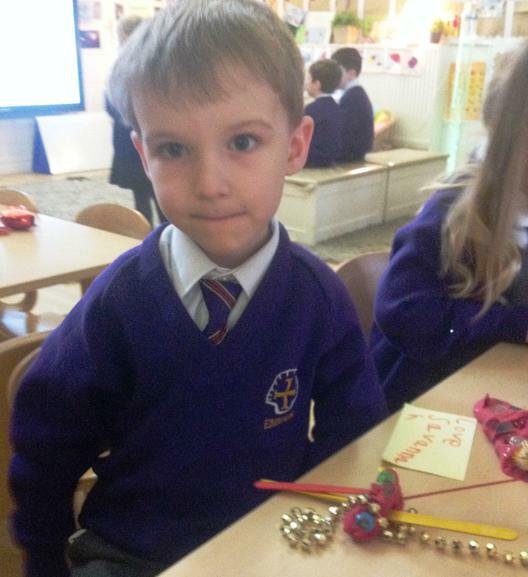 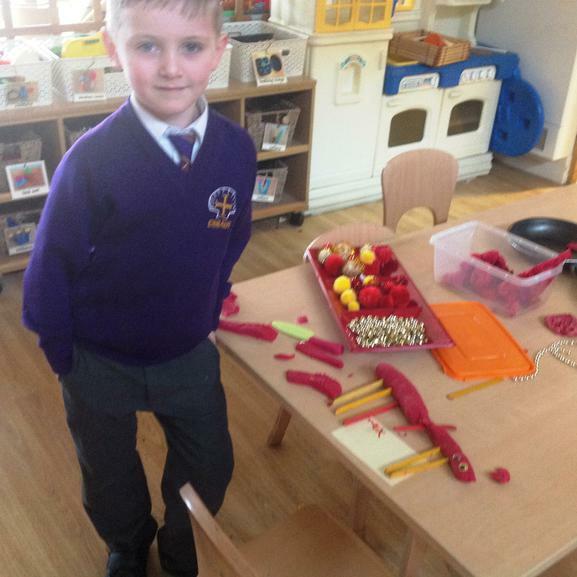 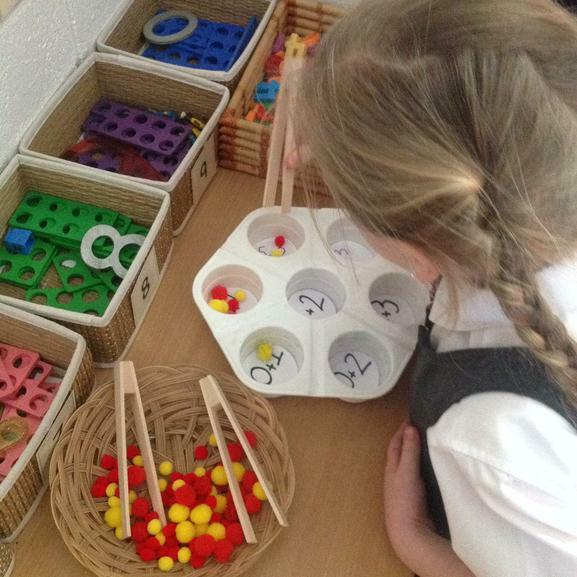 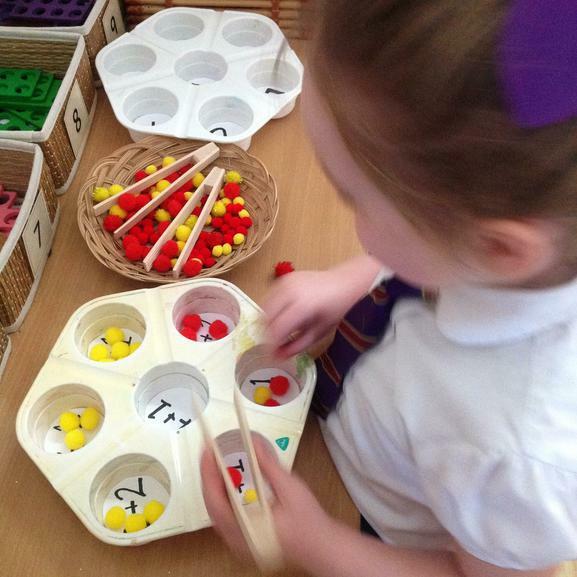 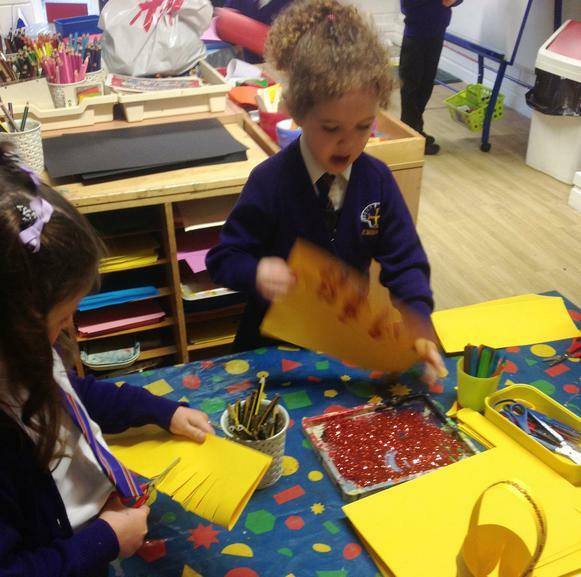 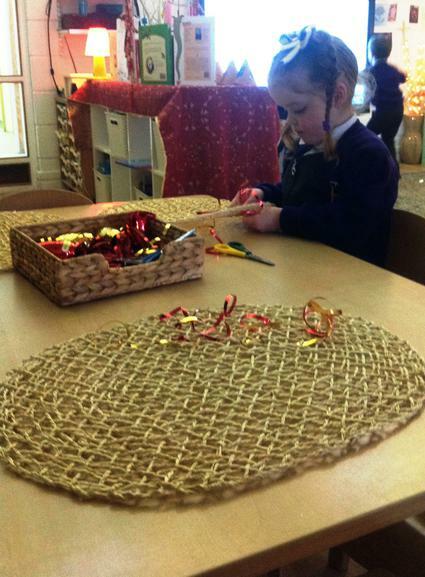 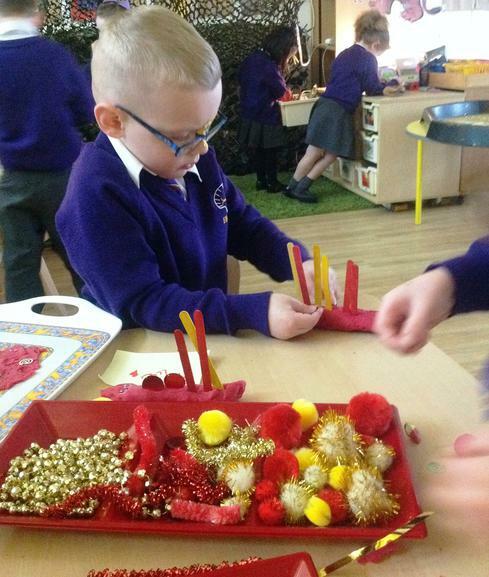 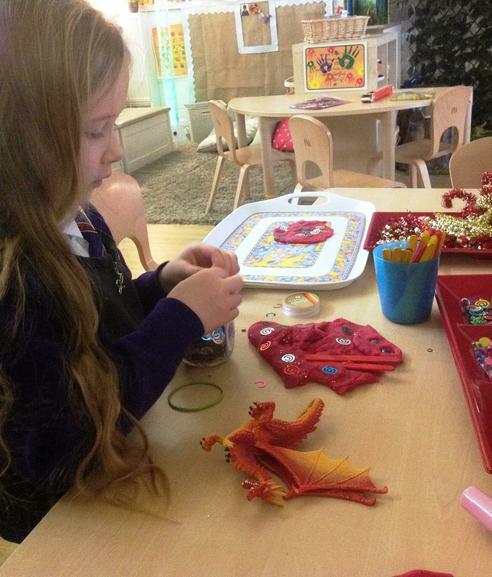 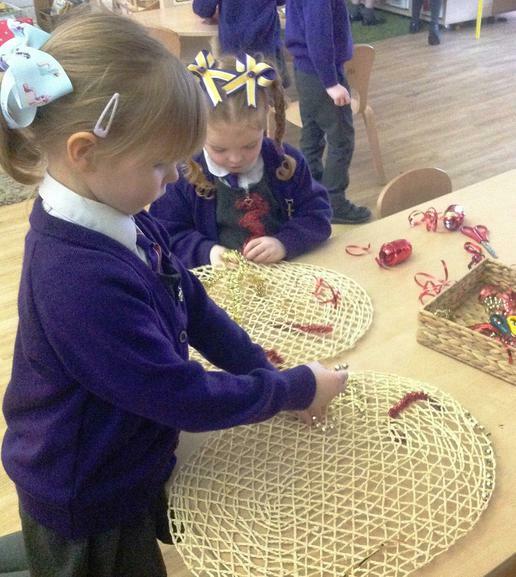 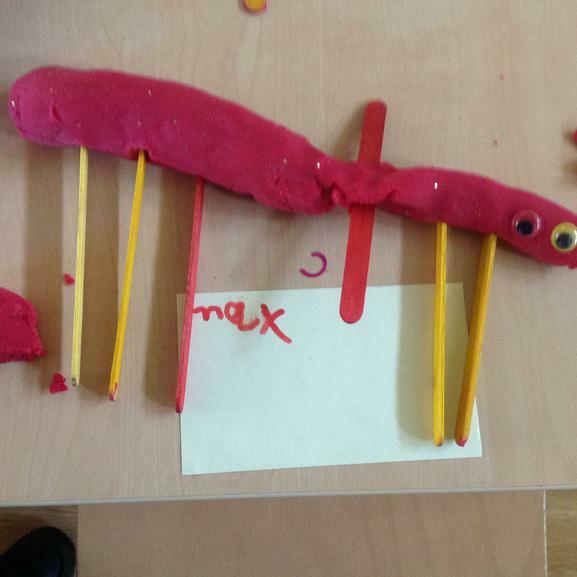 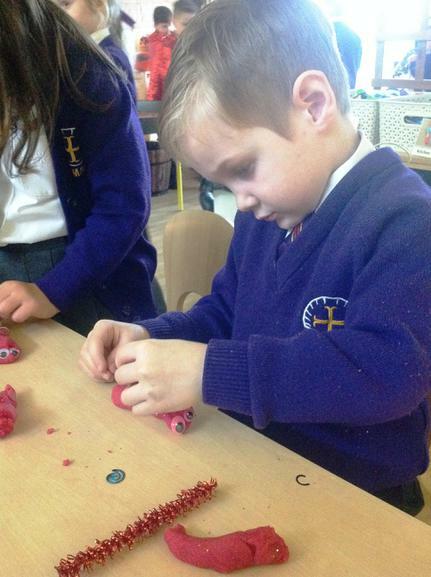 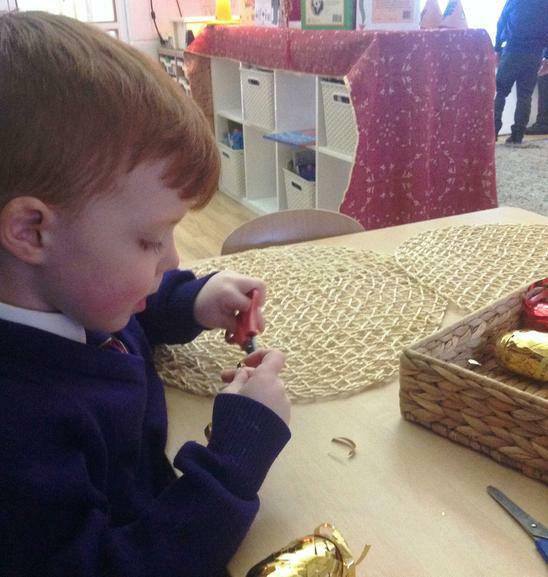 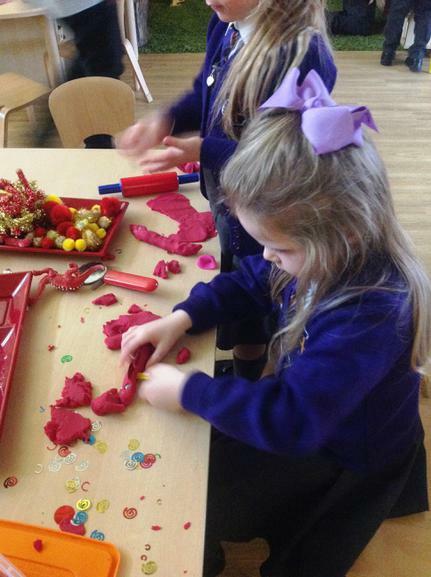 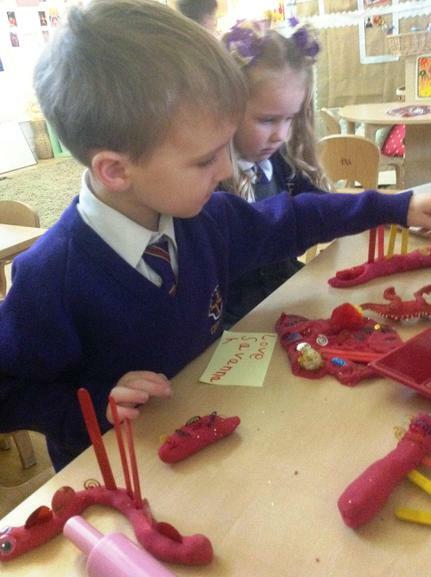 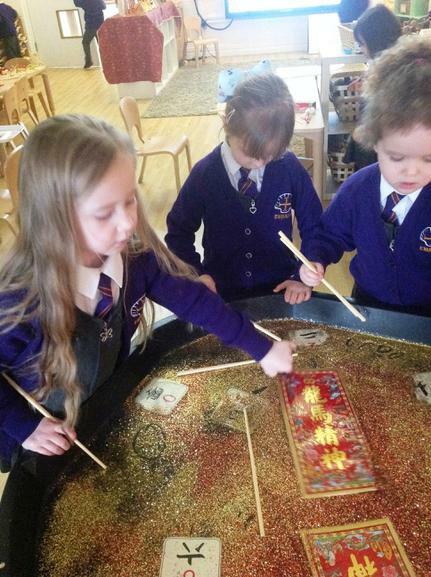 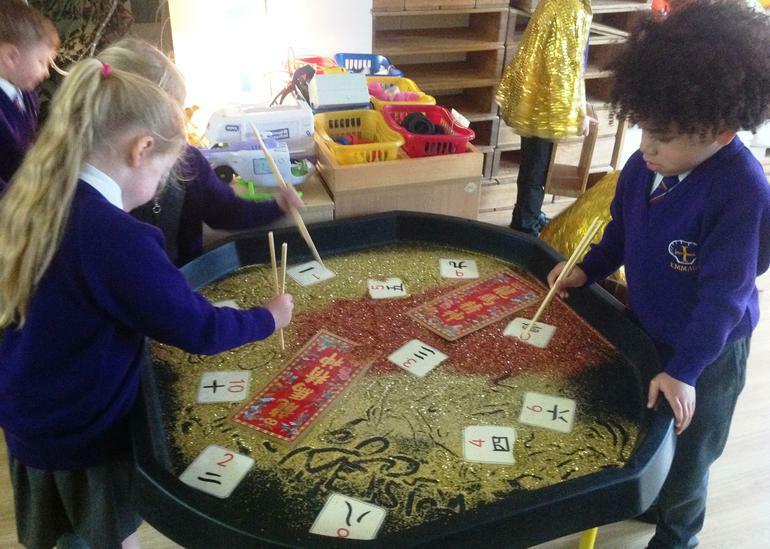 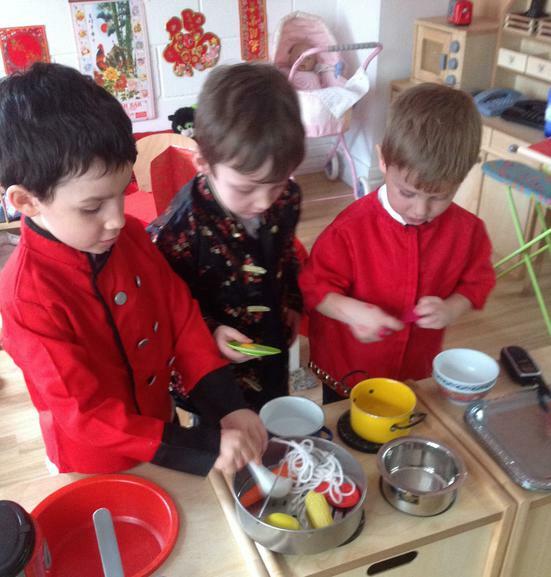 We loved developing our fine motor control making playdough Chinese dragons, mark-making with chopsticks and weaving bamboo mats with red and gold ribbon. 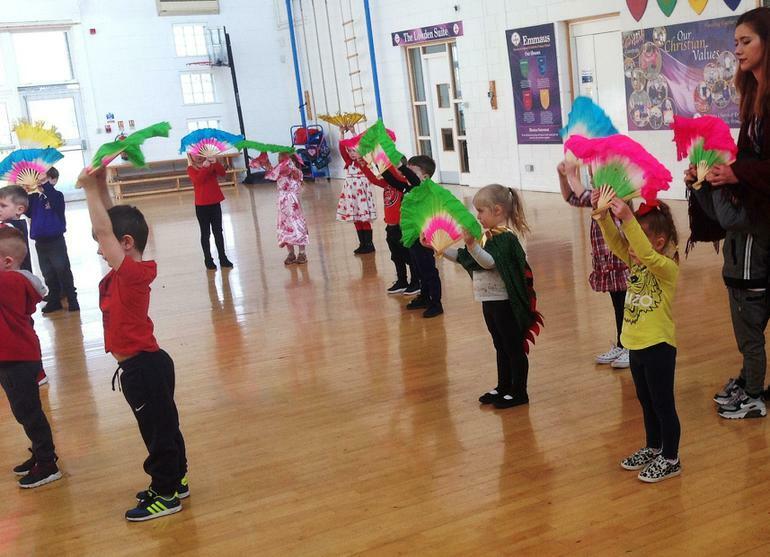 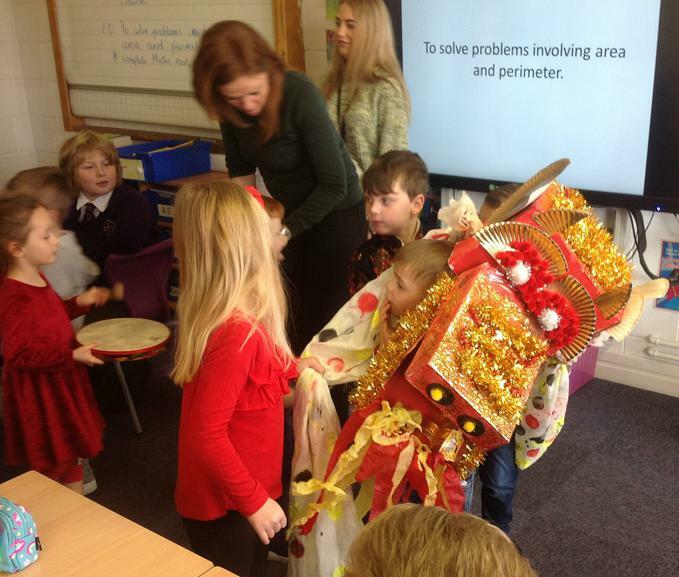 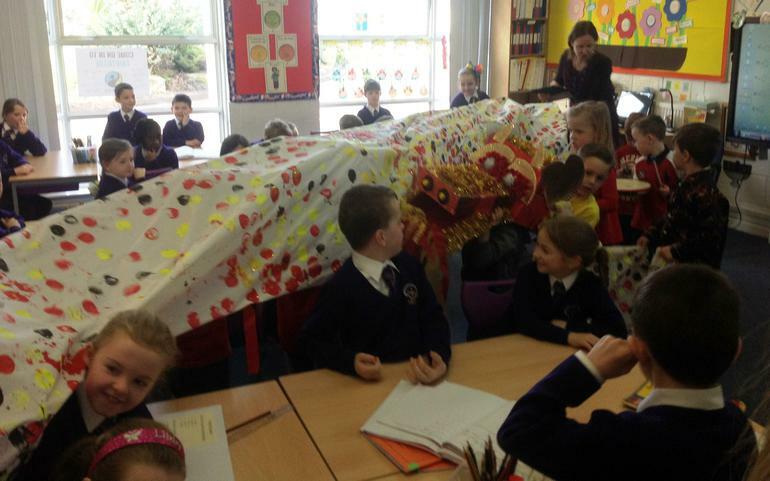 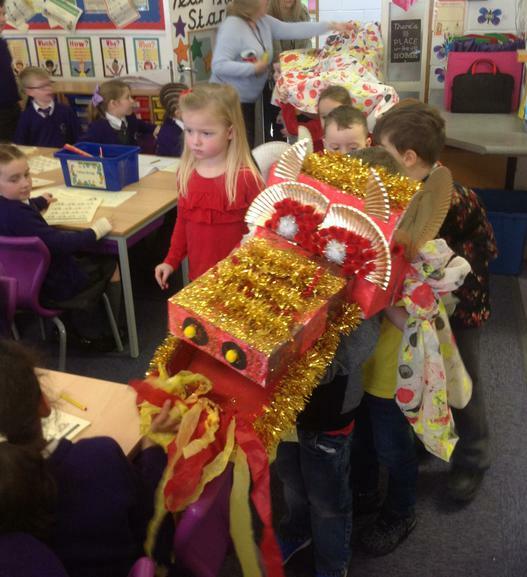 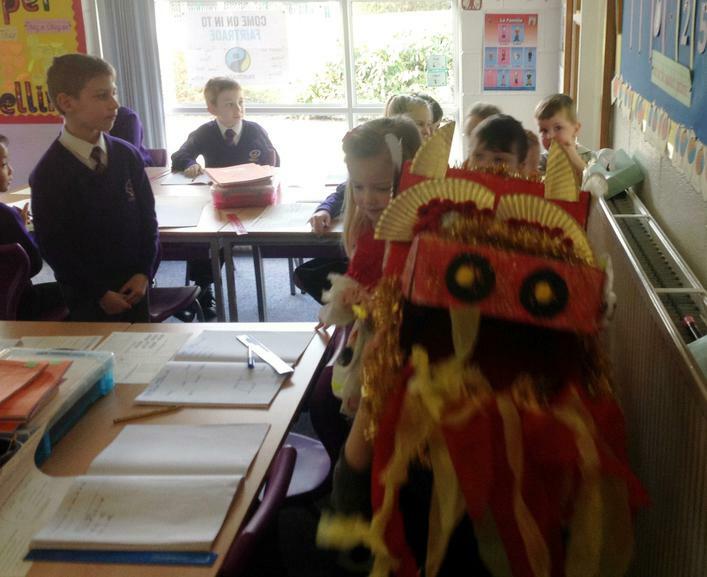 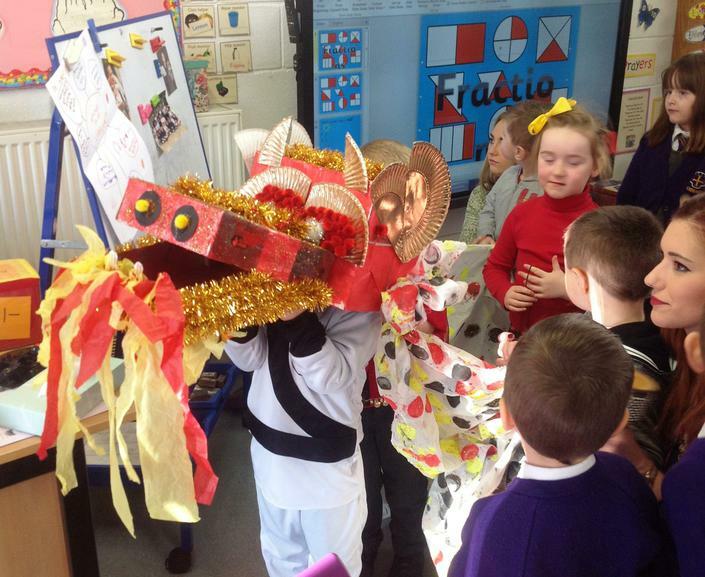 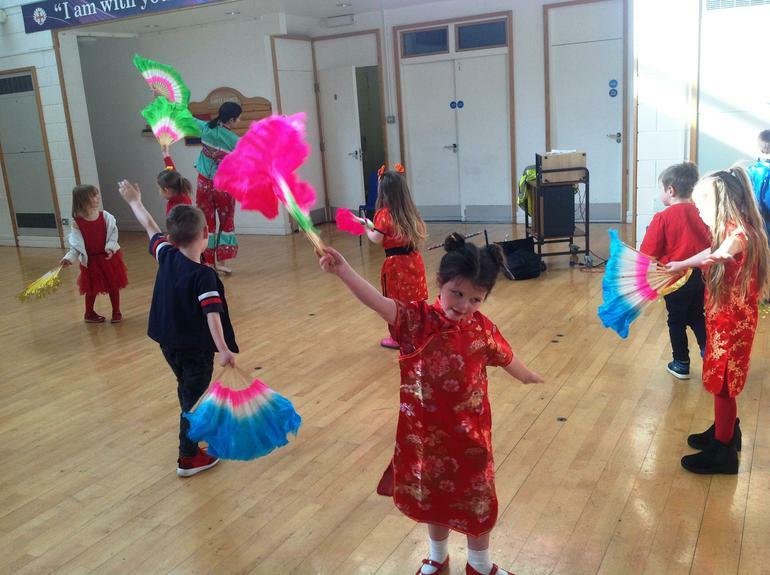 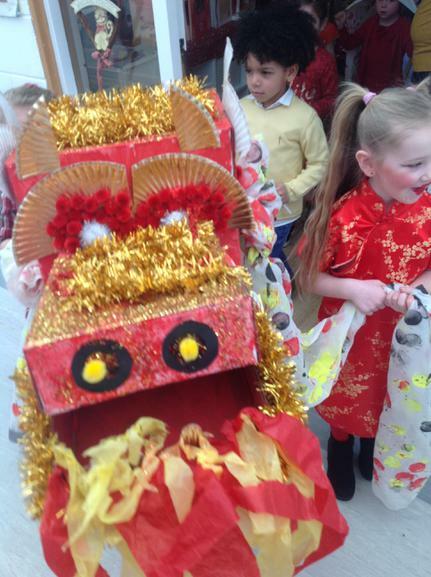 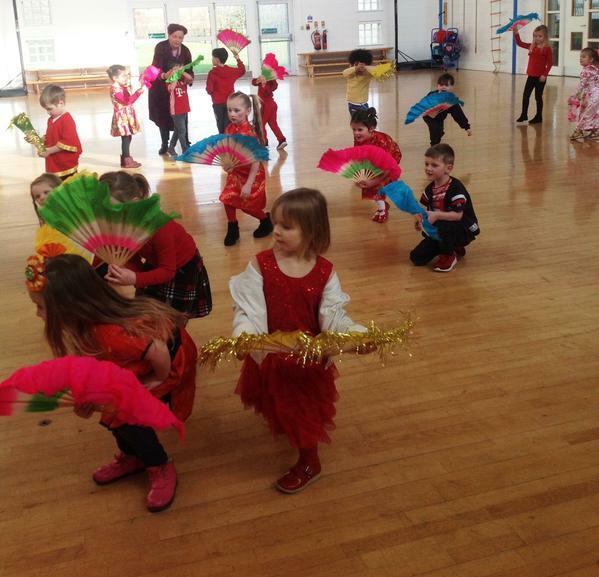 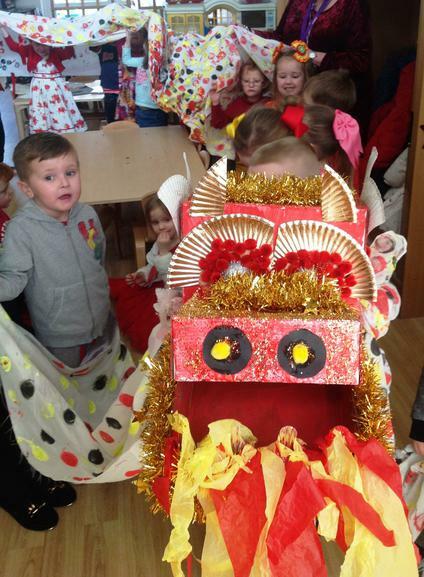 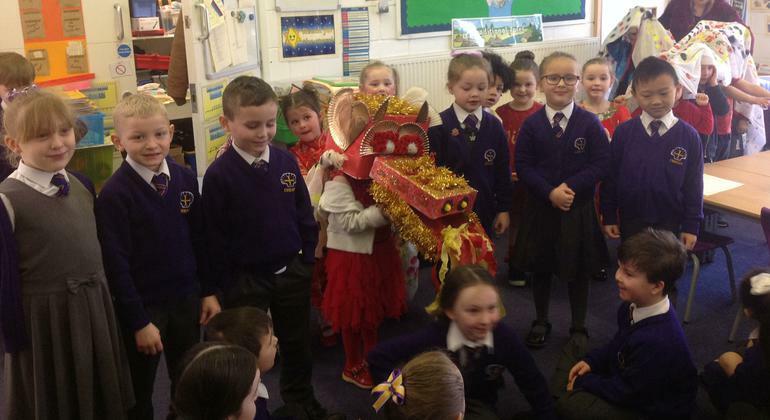 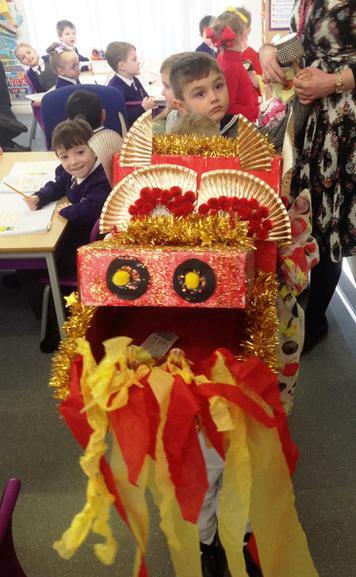 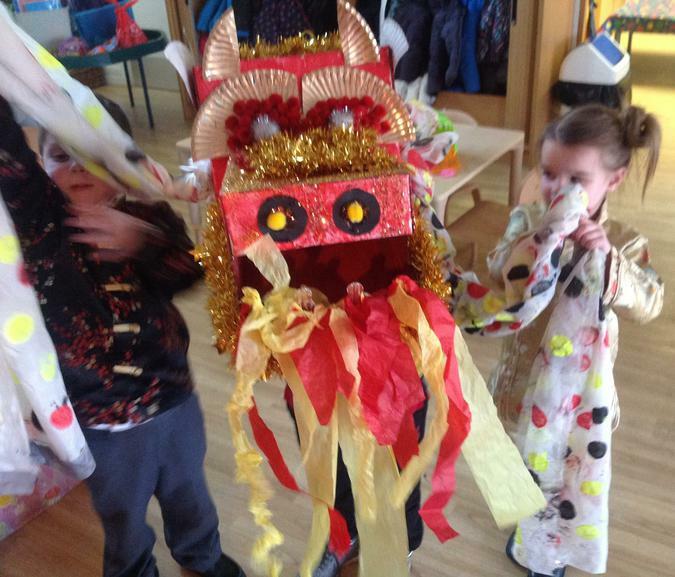 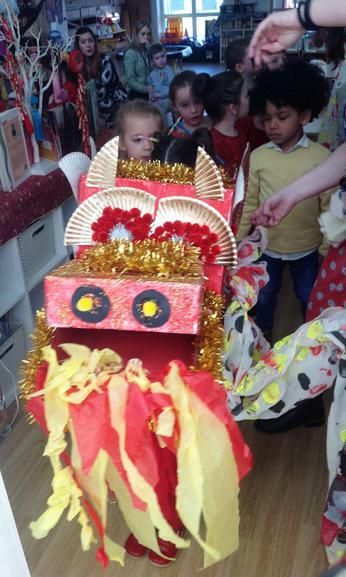 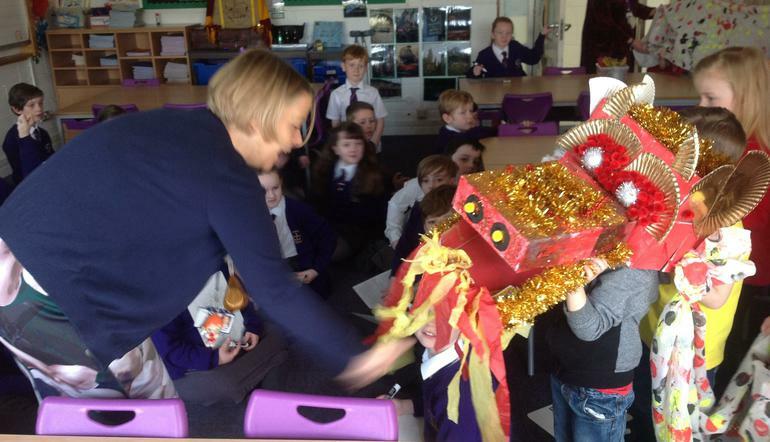 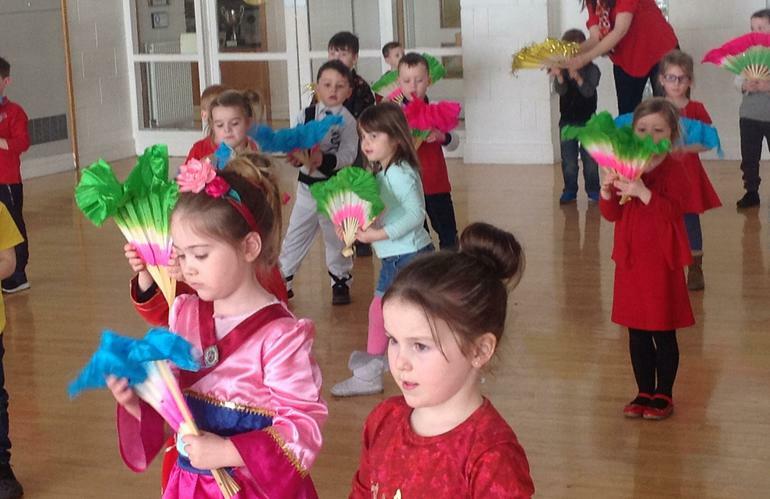 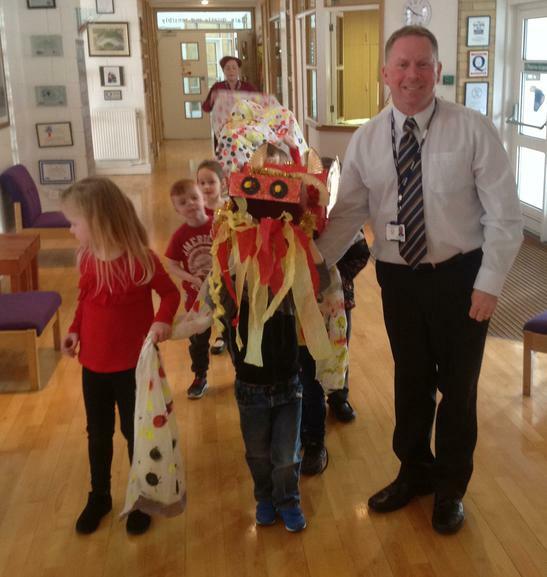 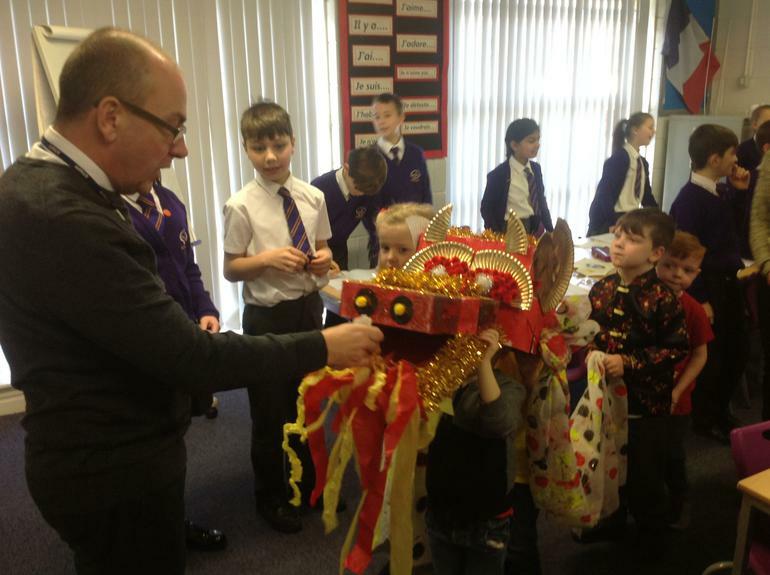 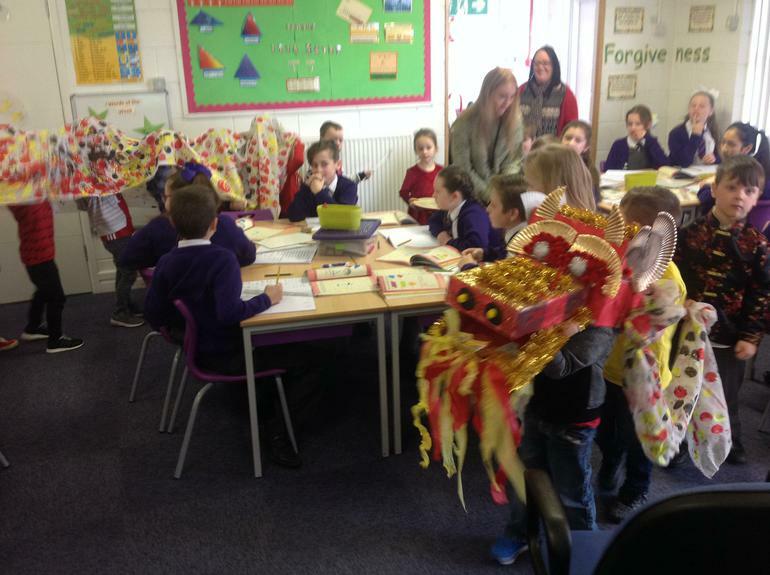 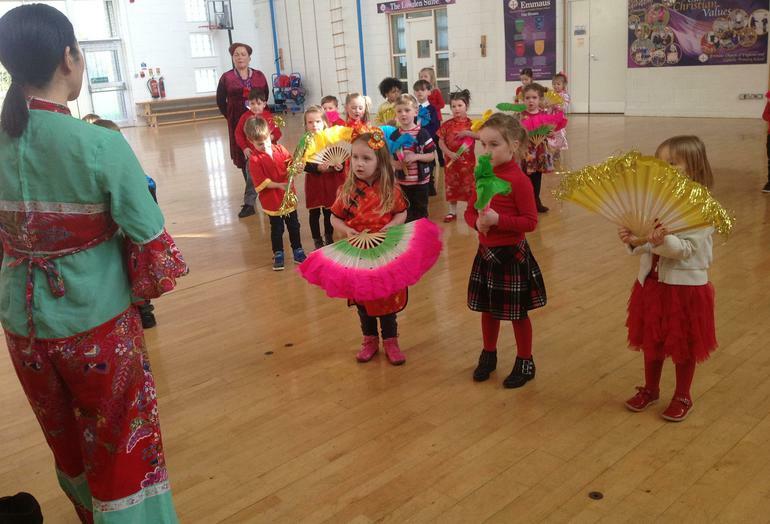 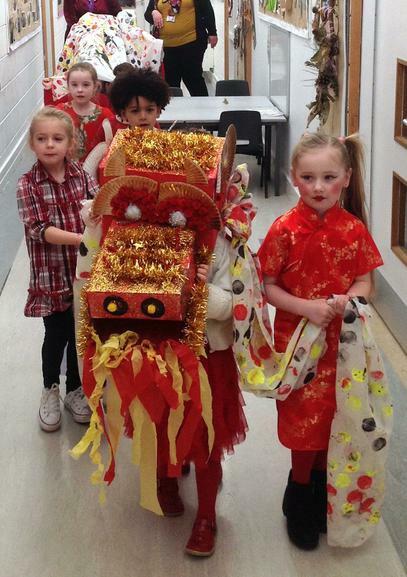 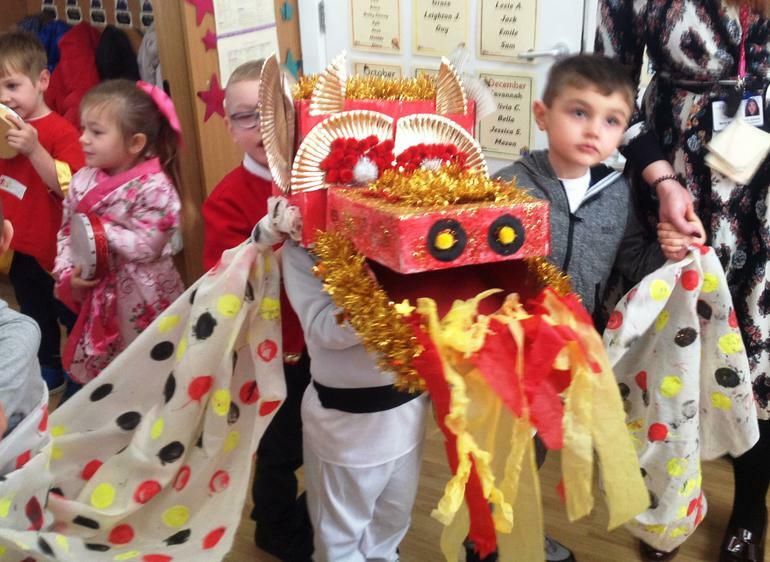 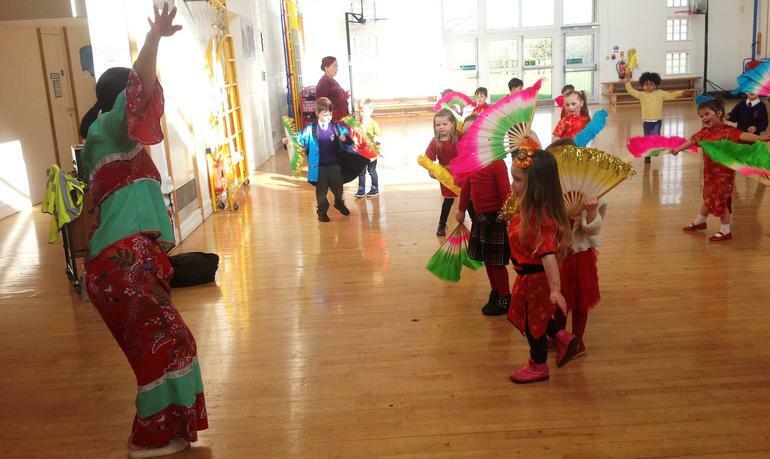 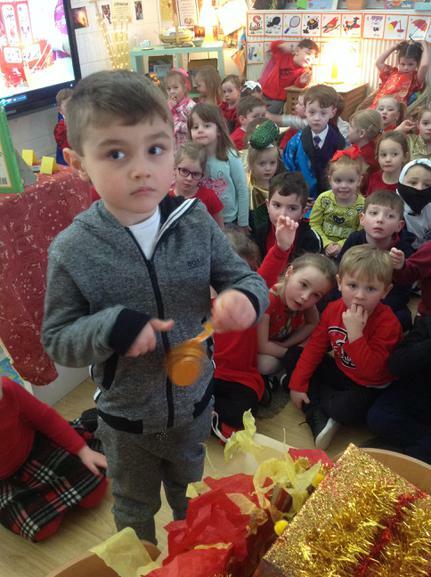 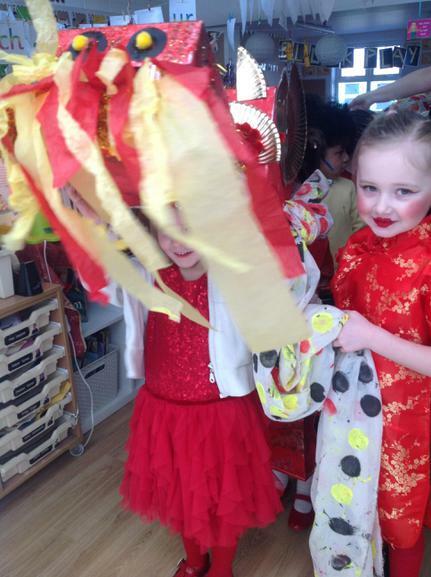 The whole school were thrilled when we visited each class with our carefully made Chinese dragon, playing drums & chimes as we paraded. 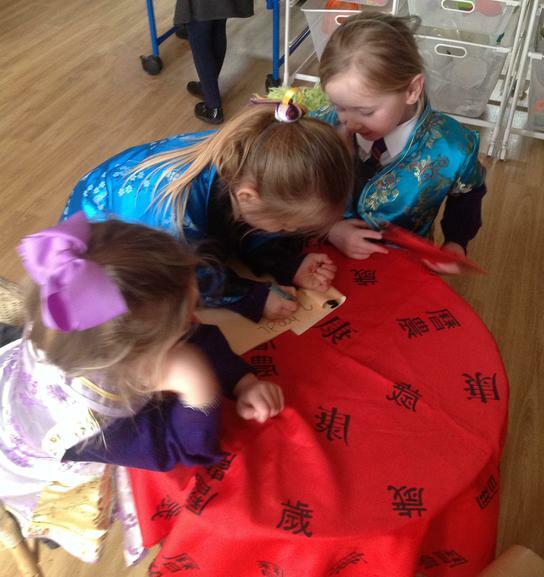 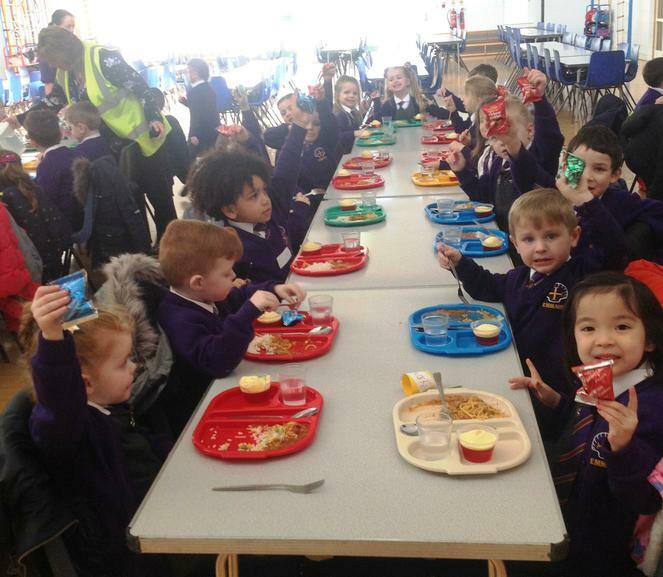 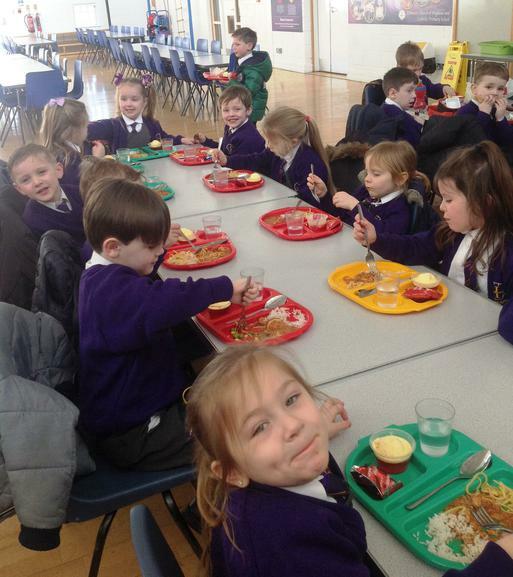 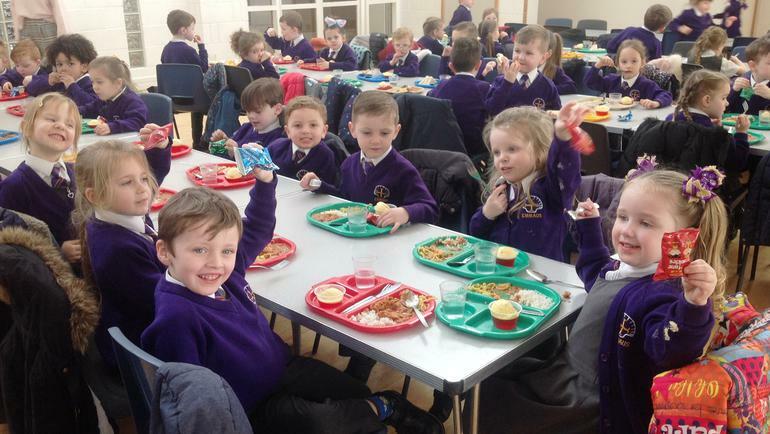 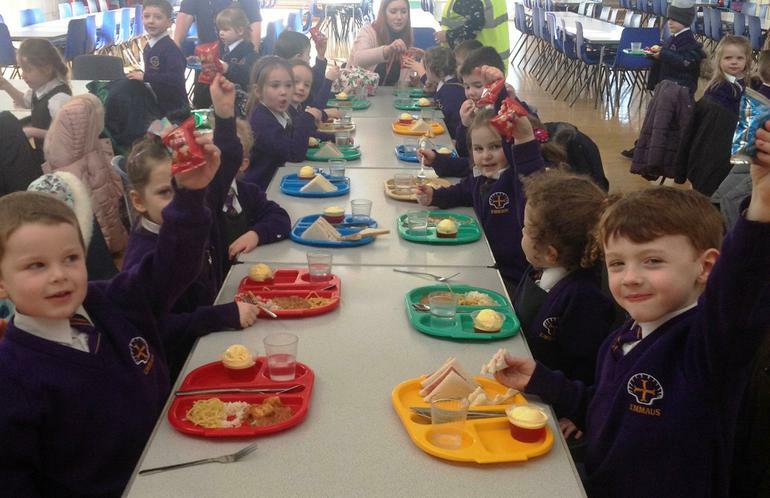 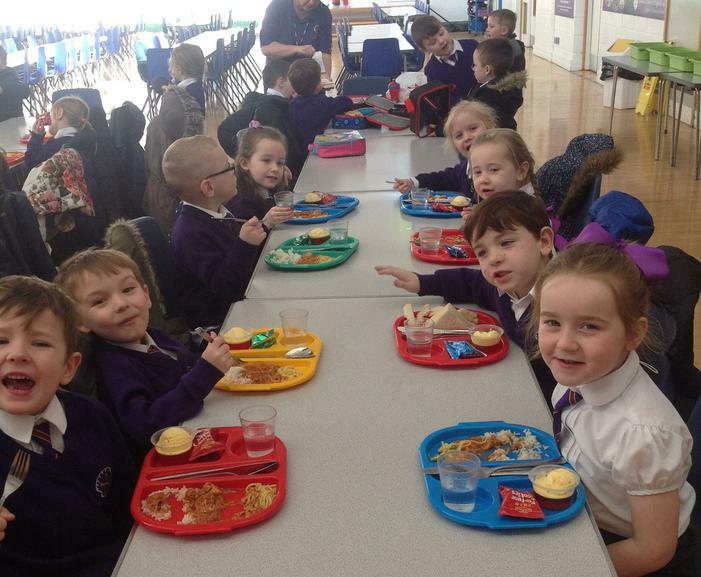 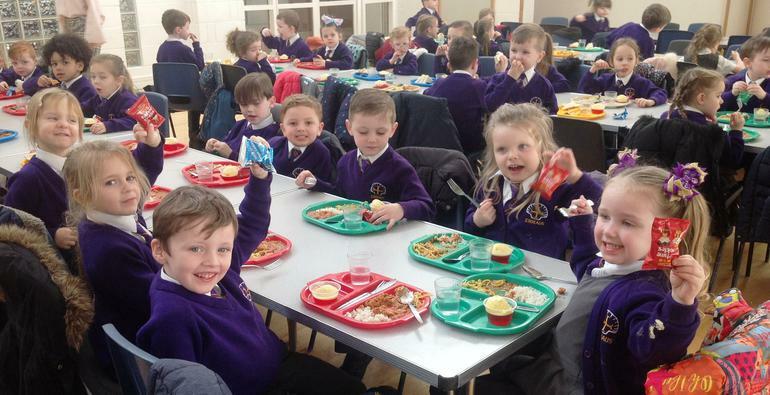 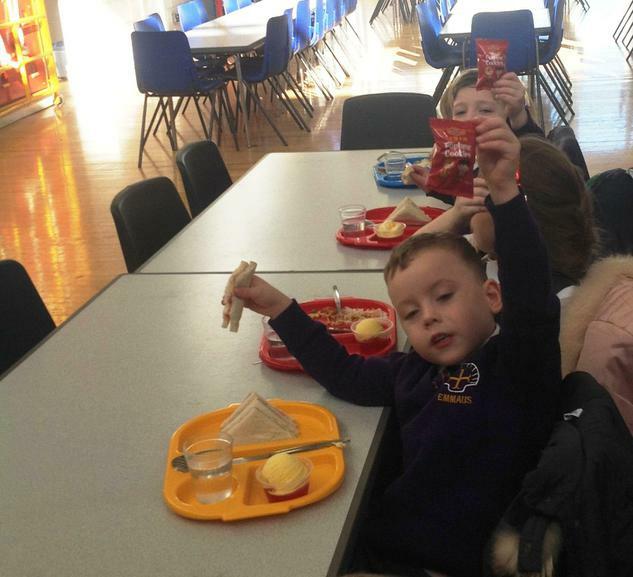 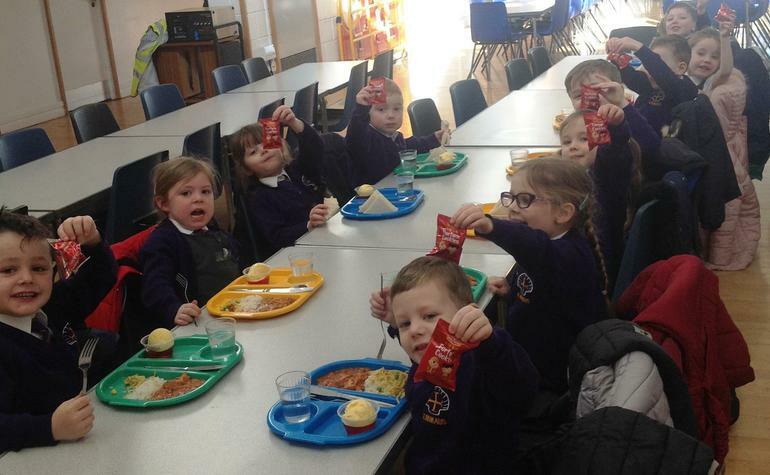 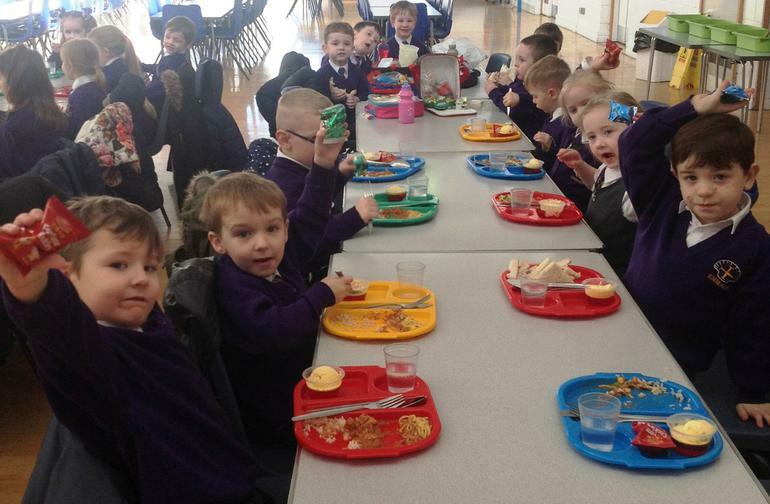 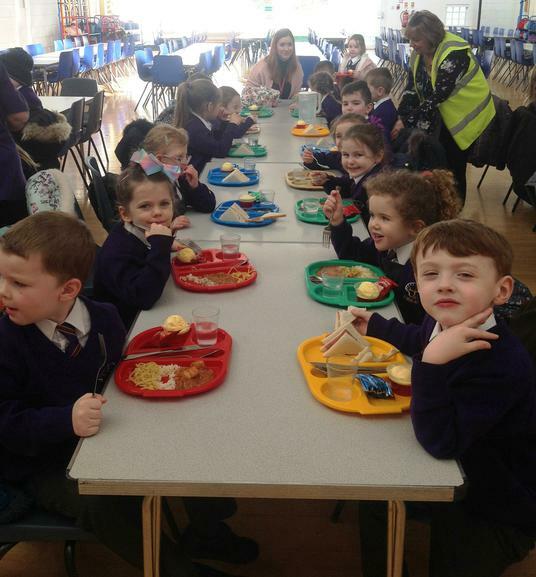 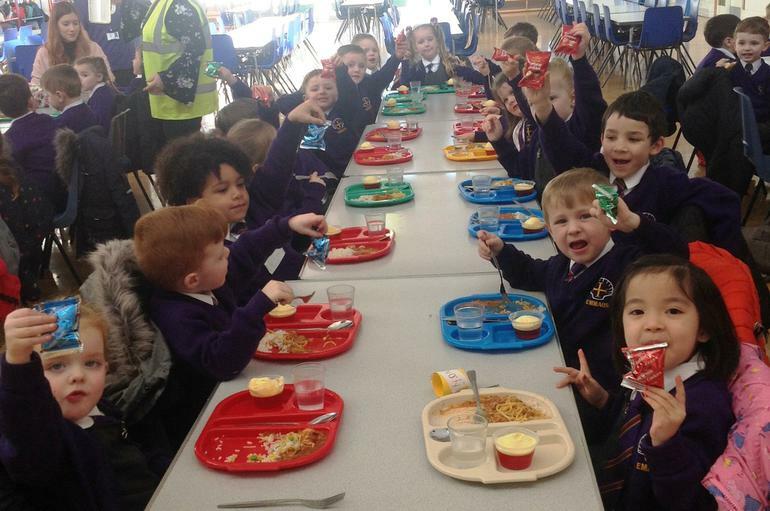 We were delighted to be rewarded with chocolate coins from all the teachers and we even enjoyed a Chinese banquet prepared by the kitchen staff for school dinner too! 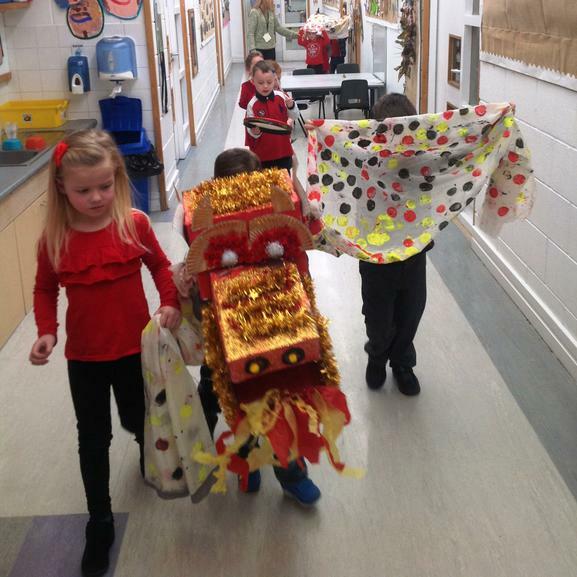 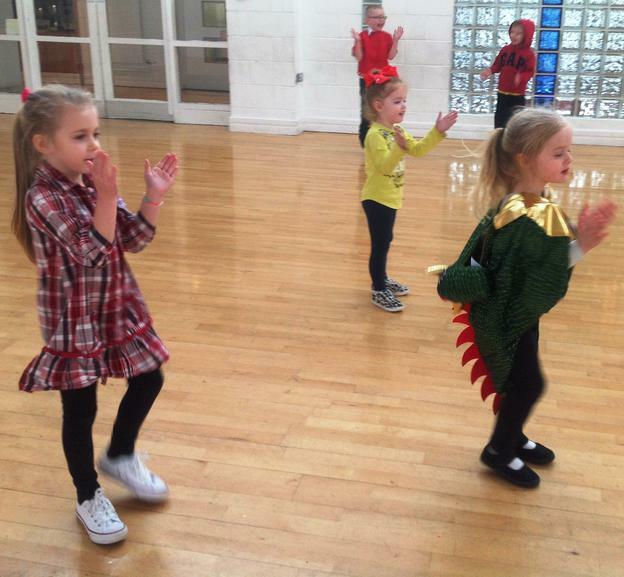 Dragon Parade around the School! 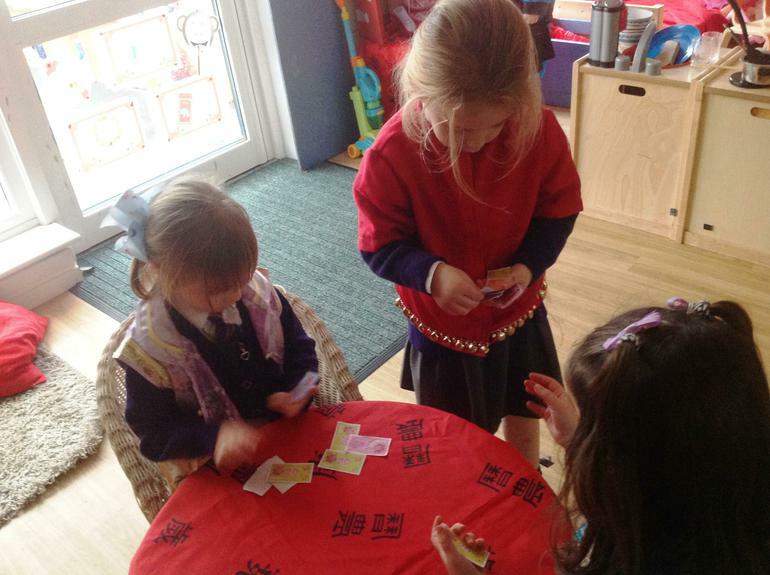 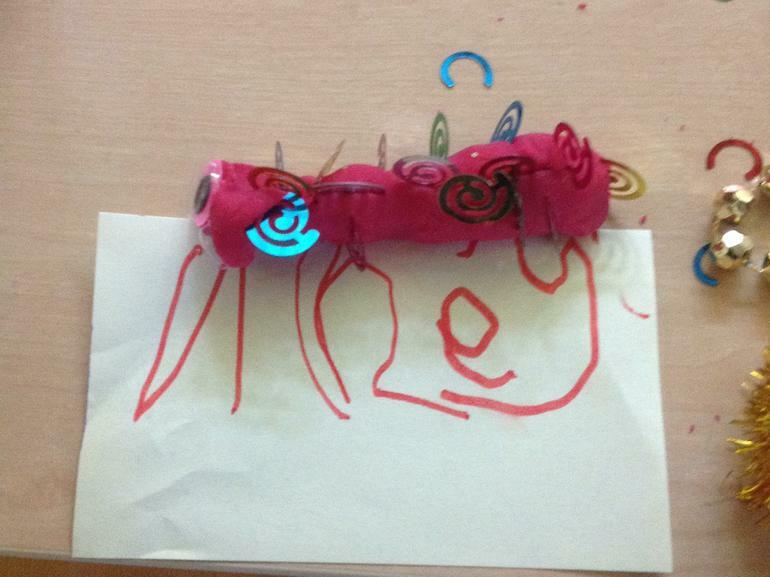 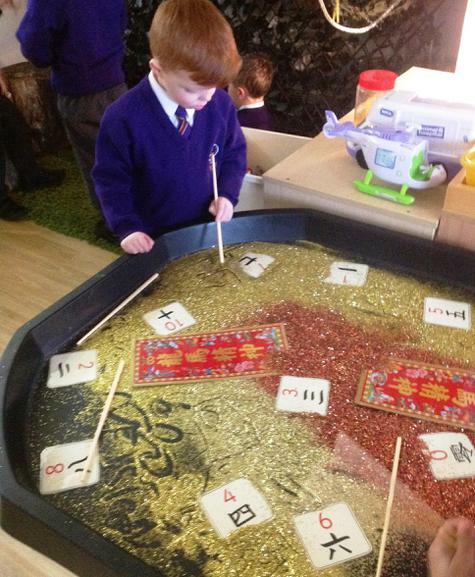 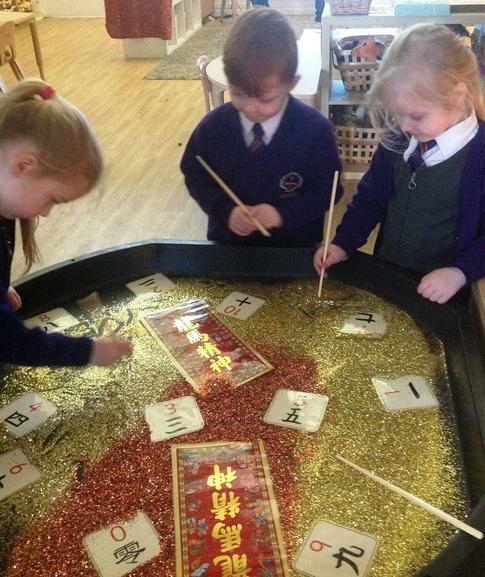 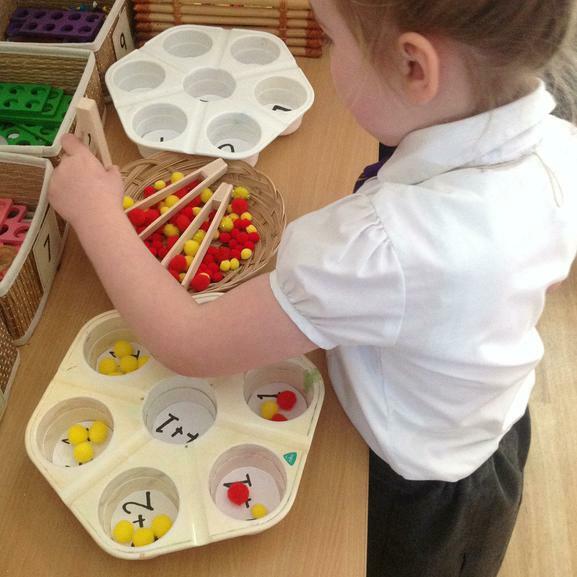 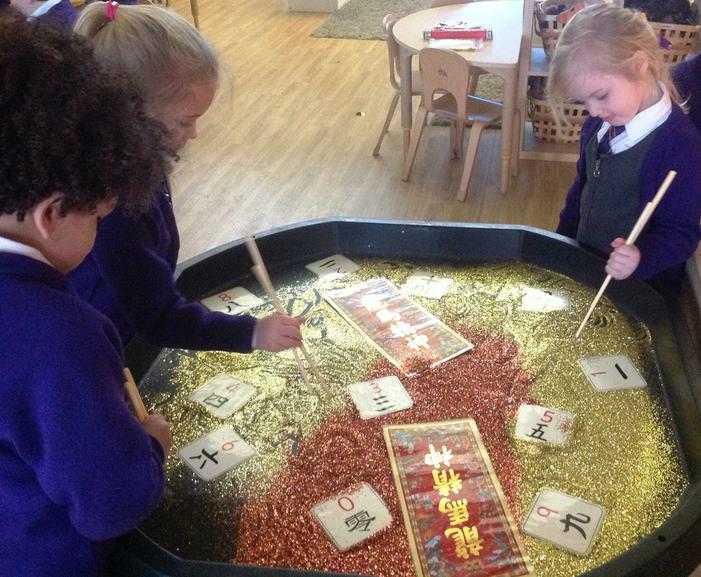 Working our Fine Motor Skils for Chinese New Year! 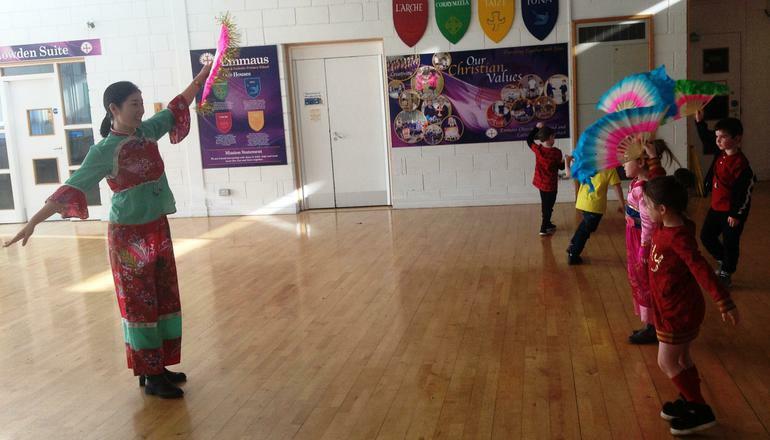 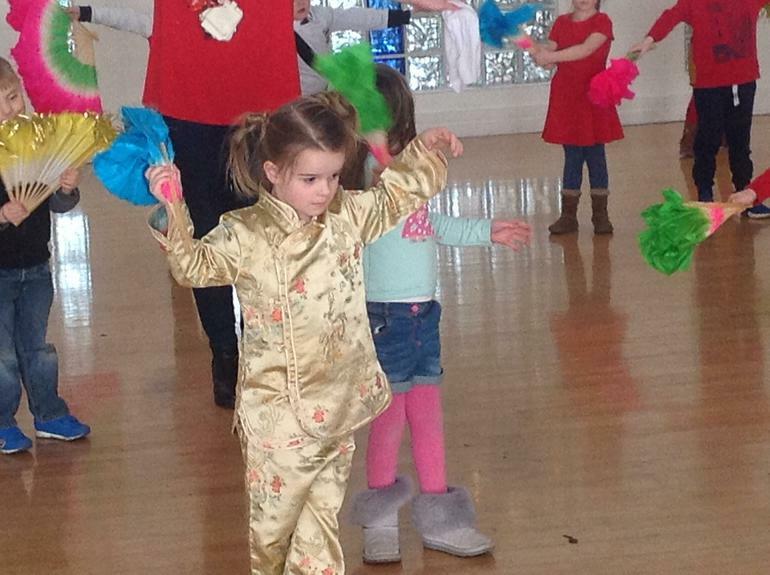 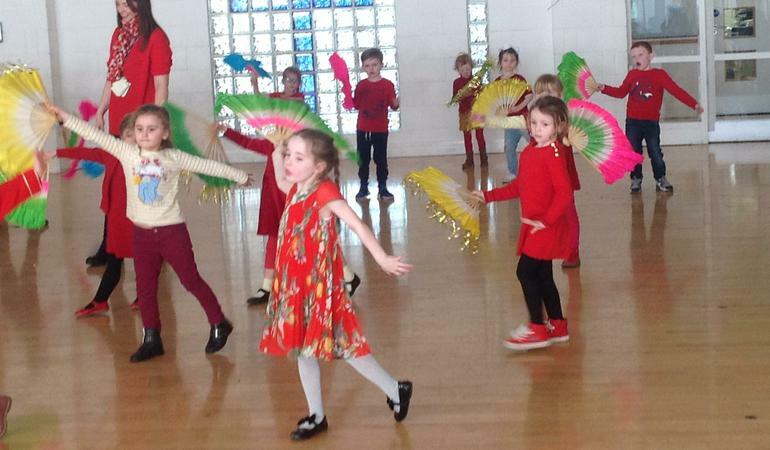 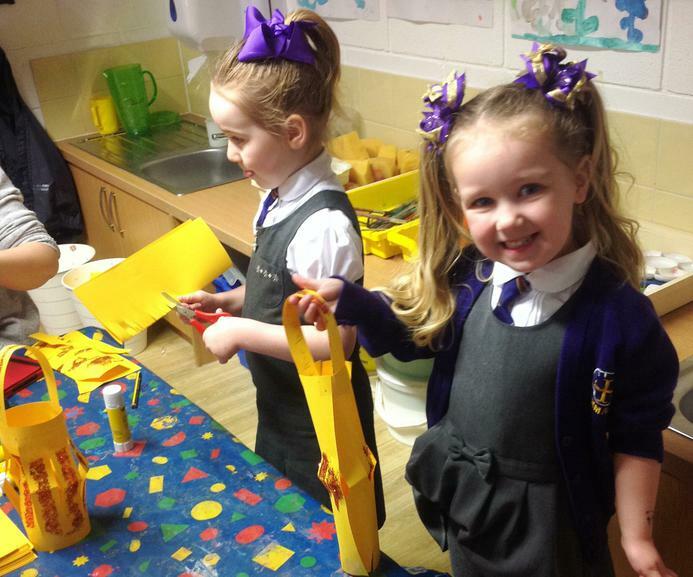 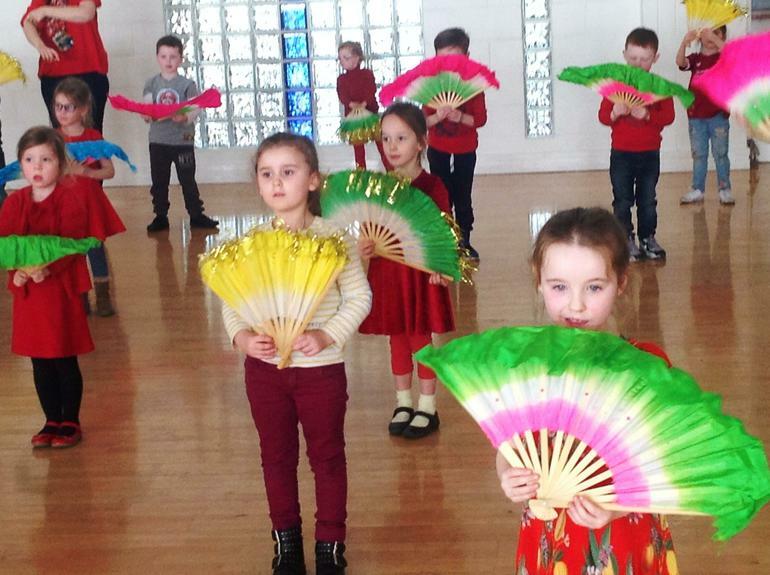 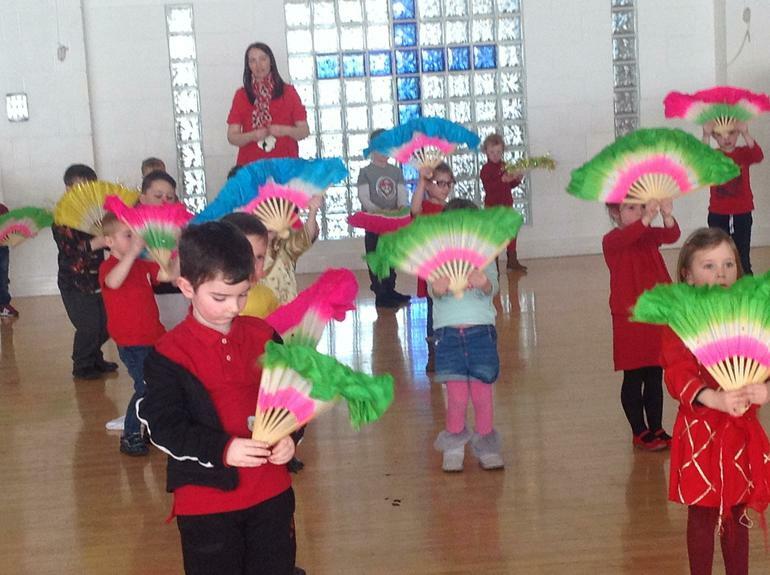 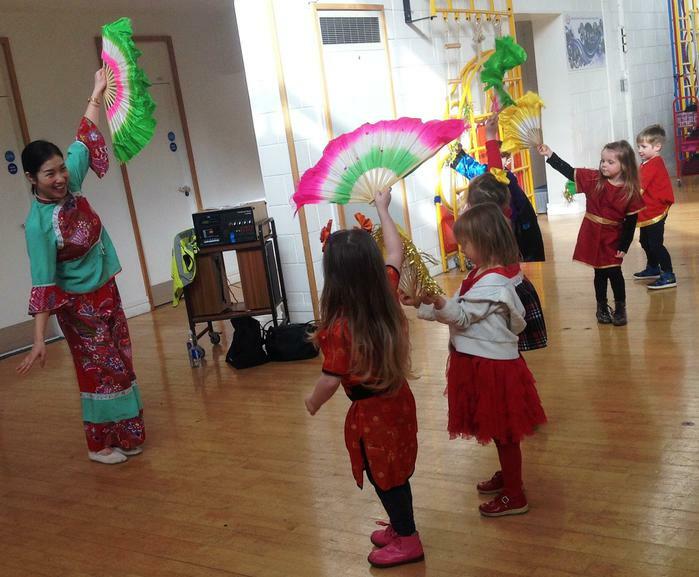 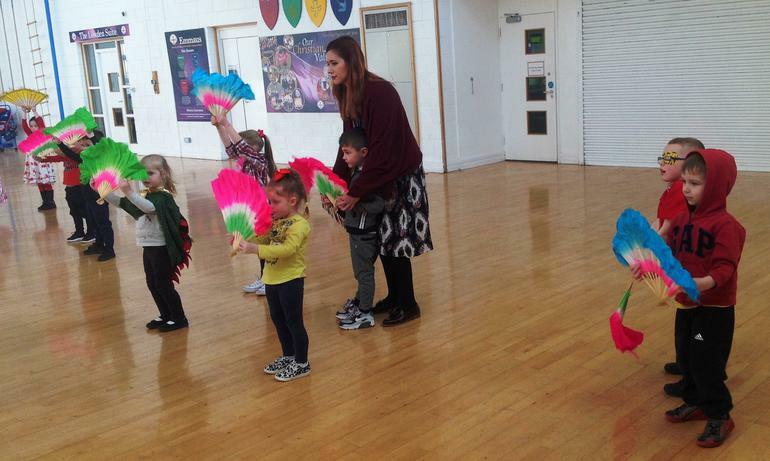 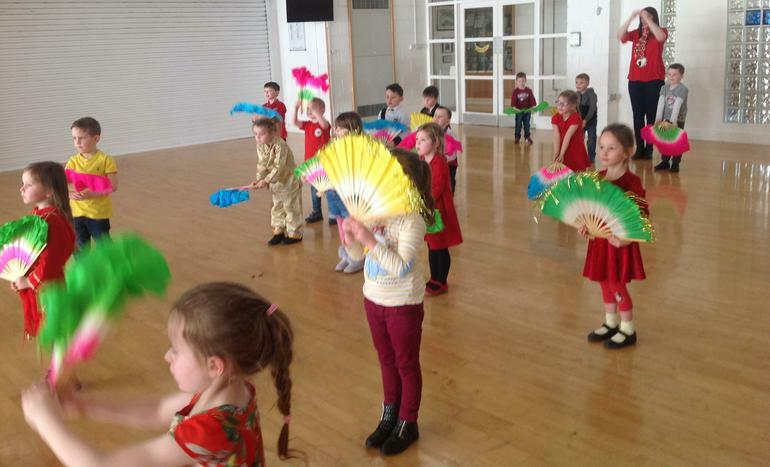 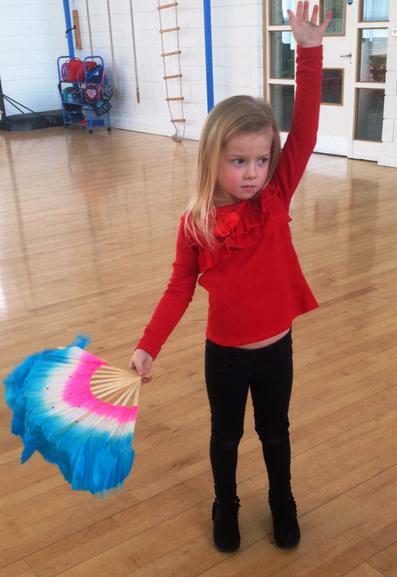 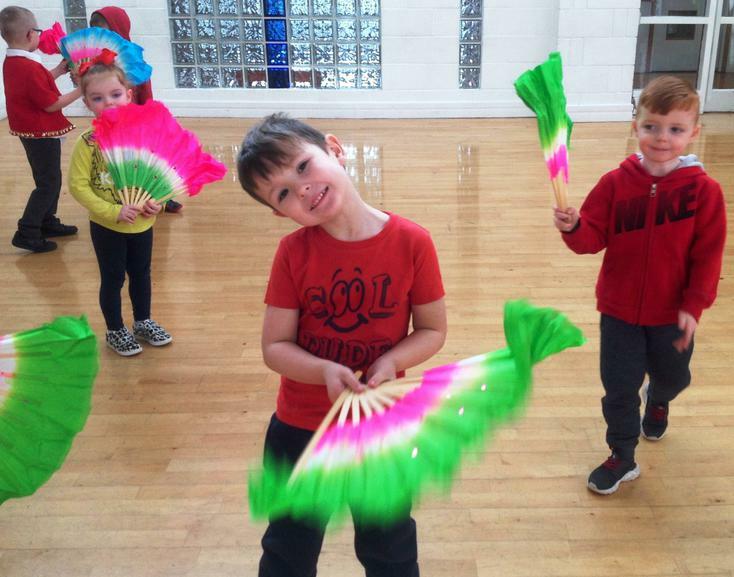 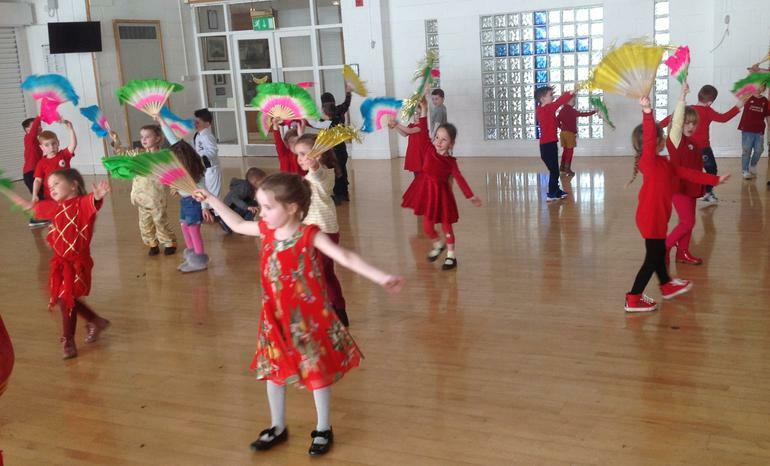 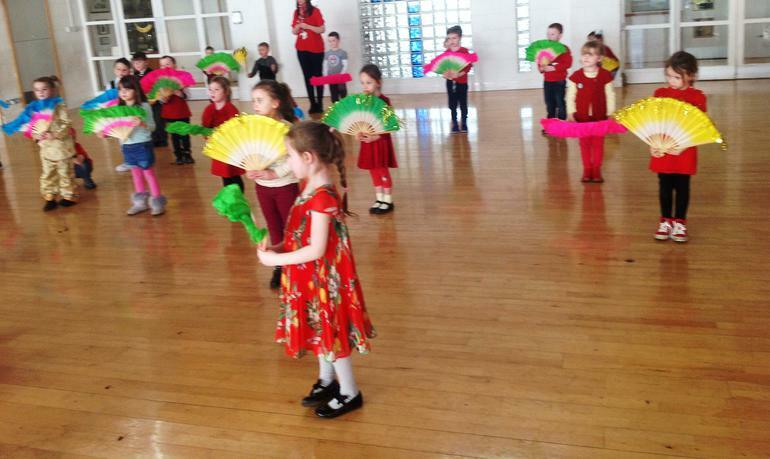 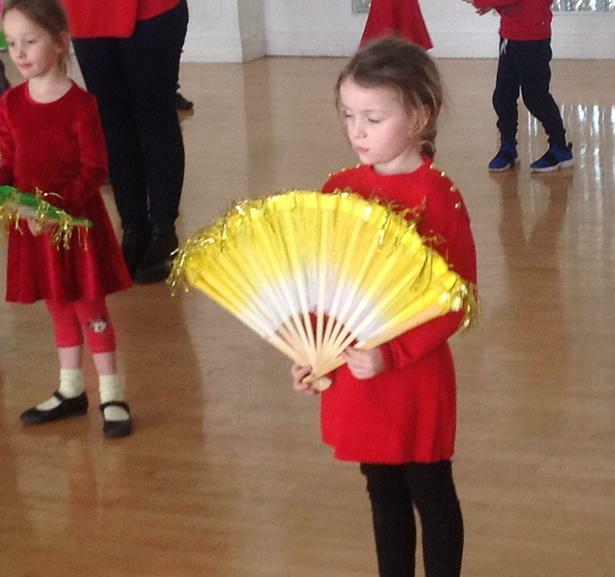 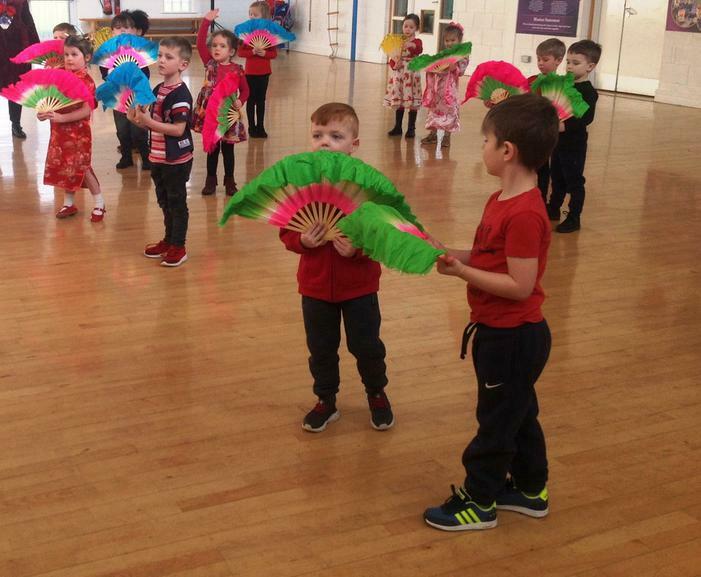 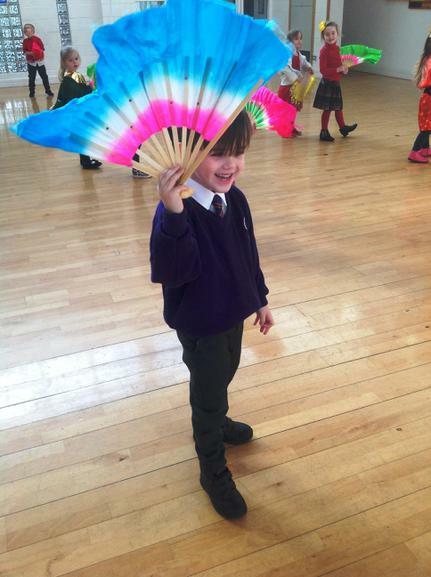 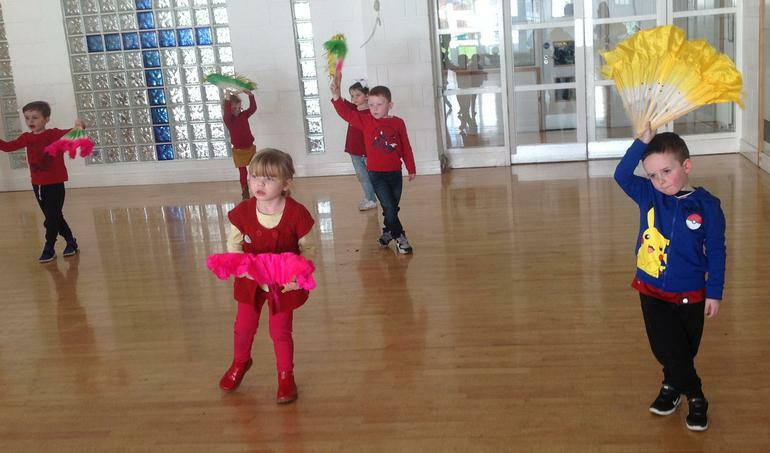 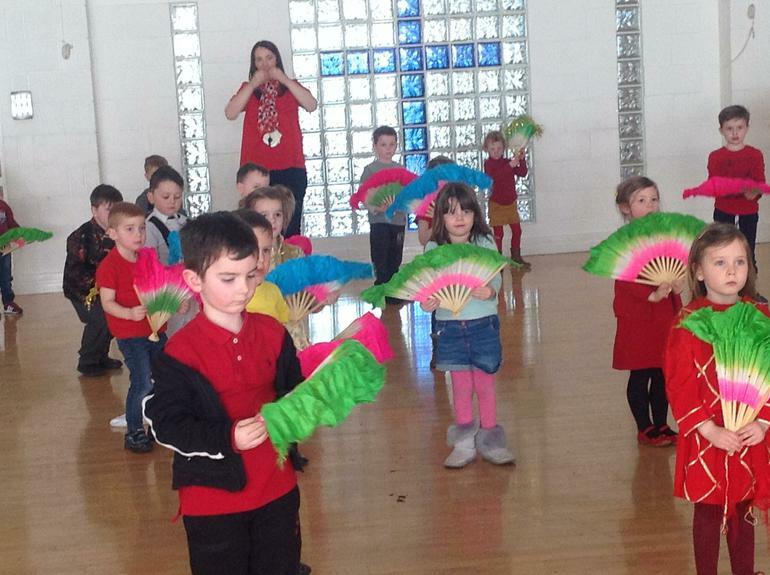 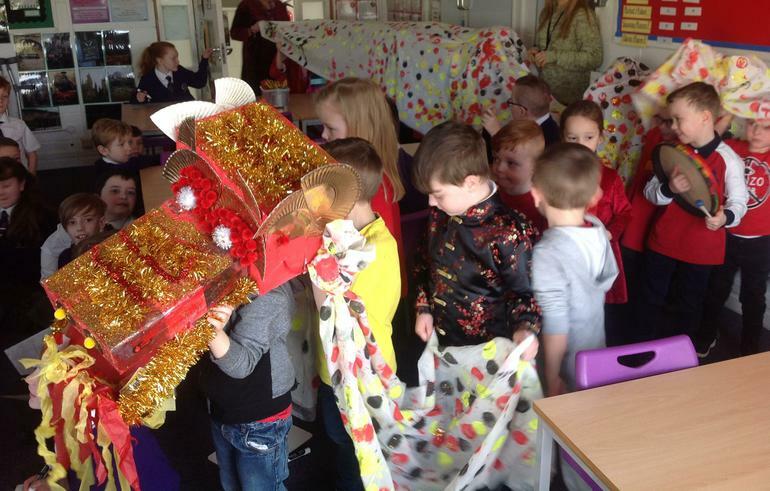 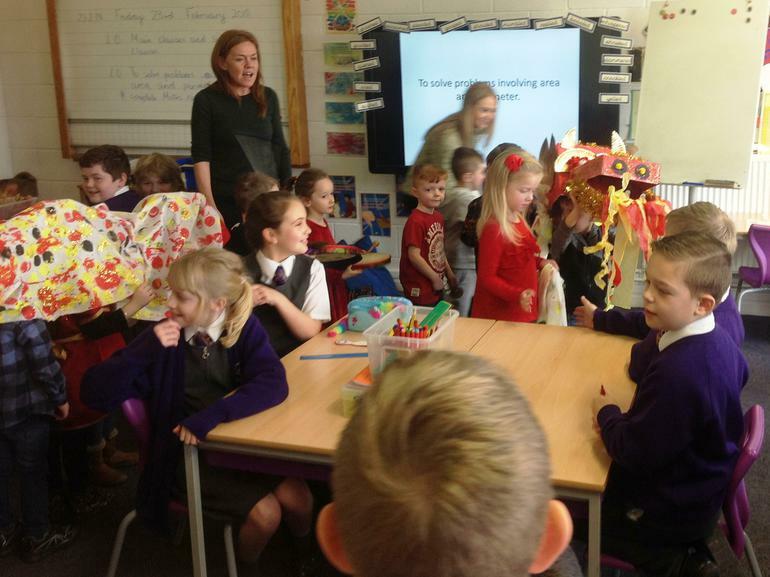 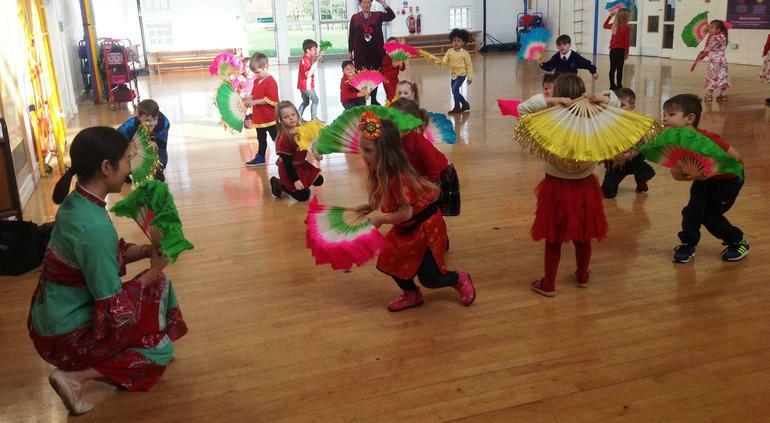 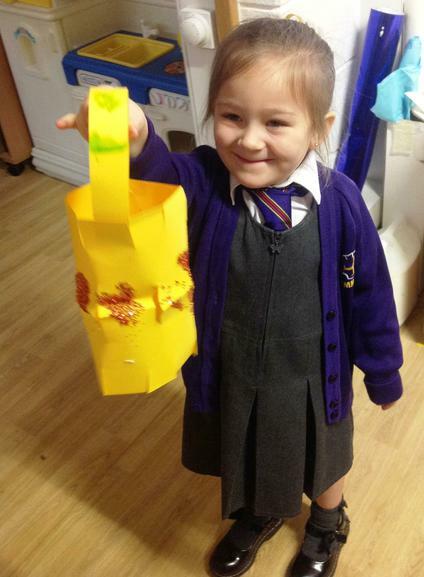 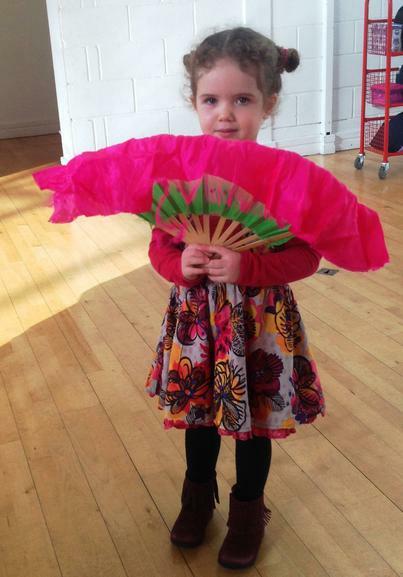 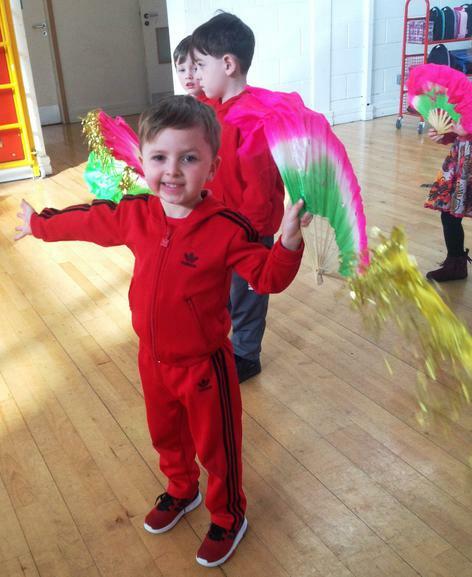 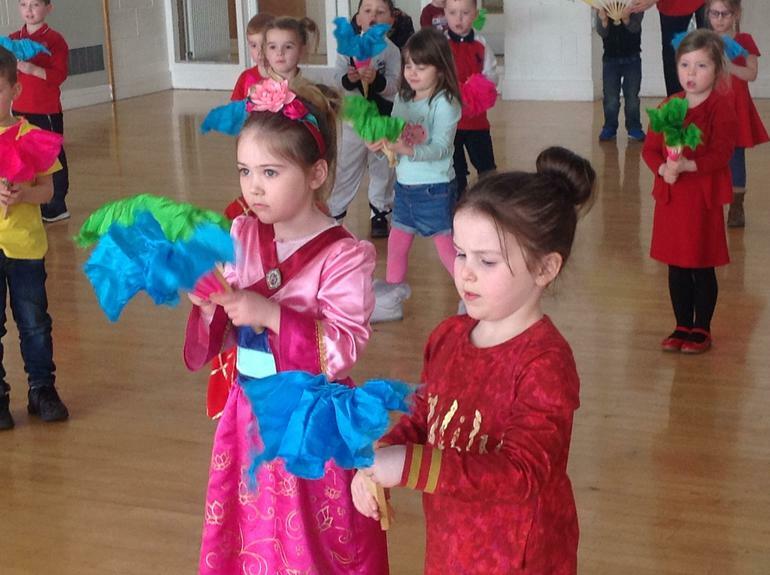 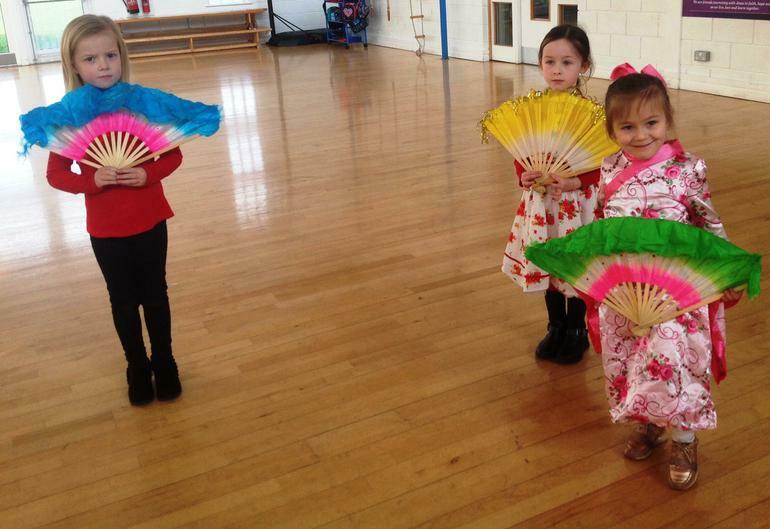 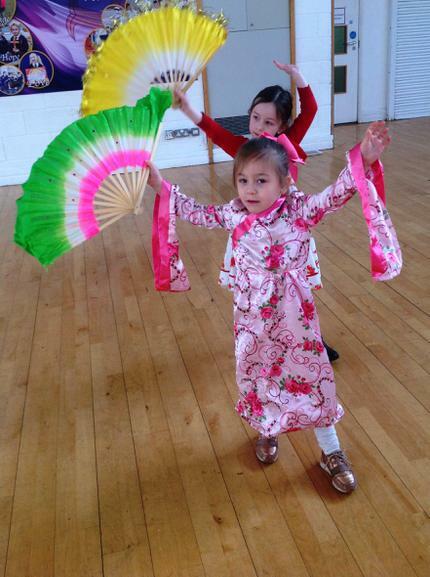 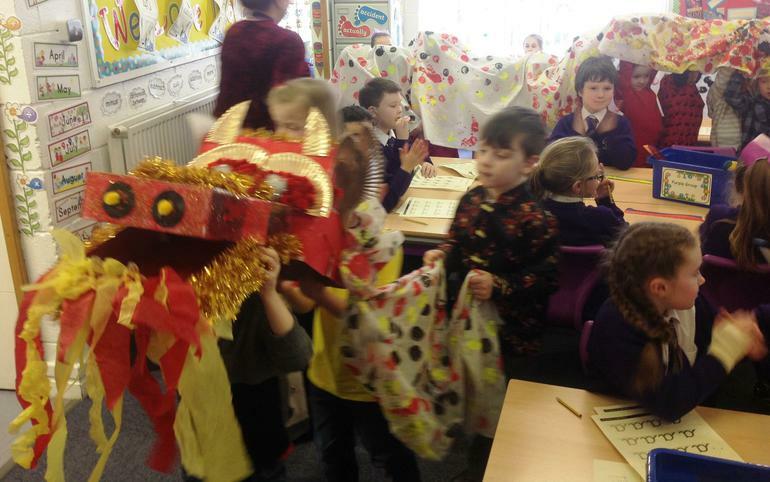 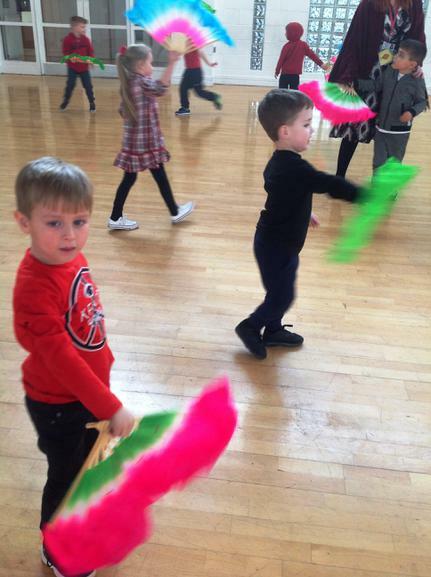 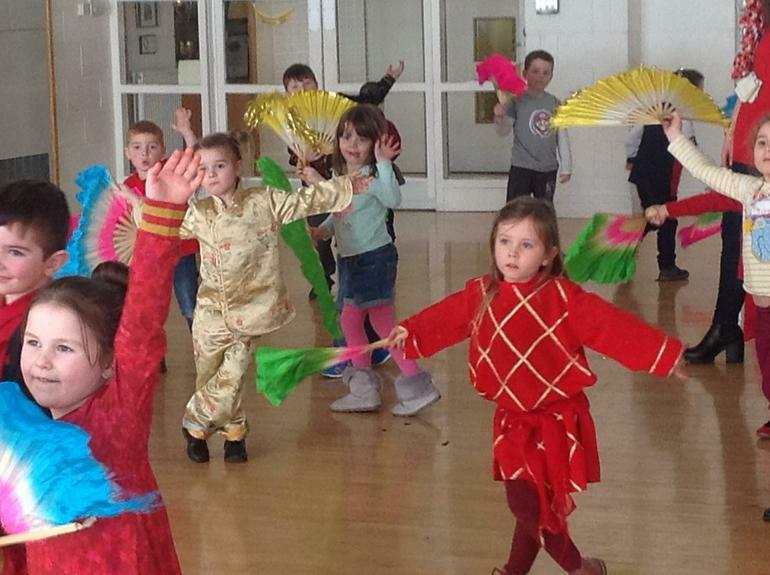 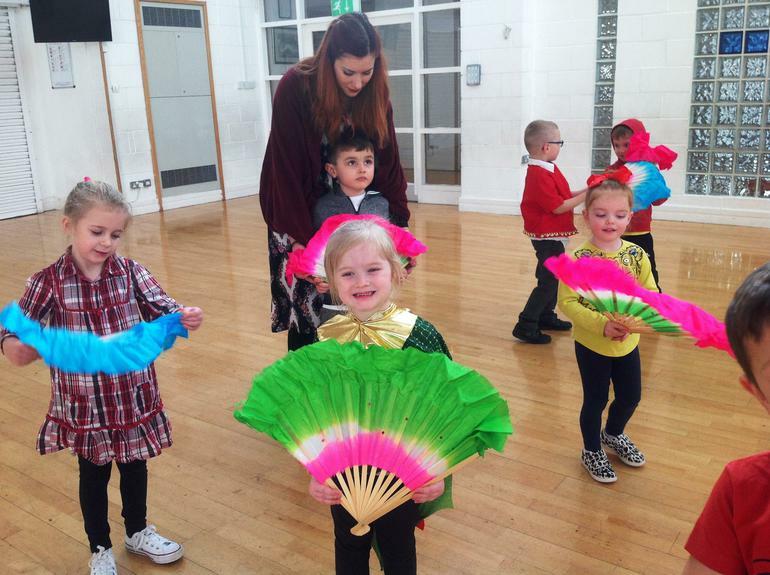 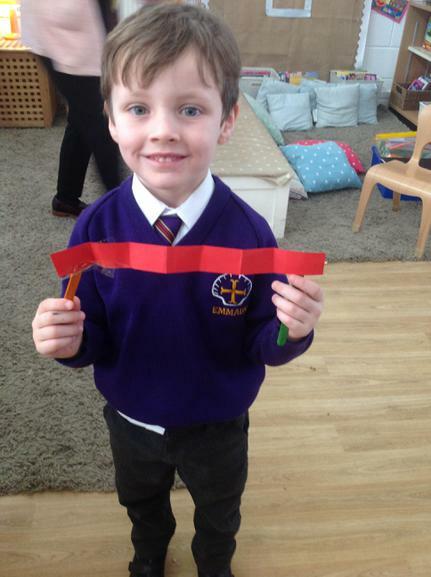 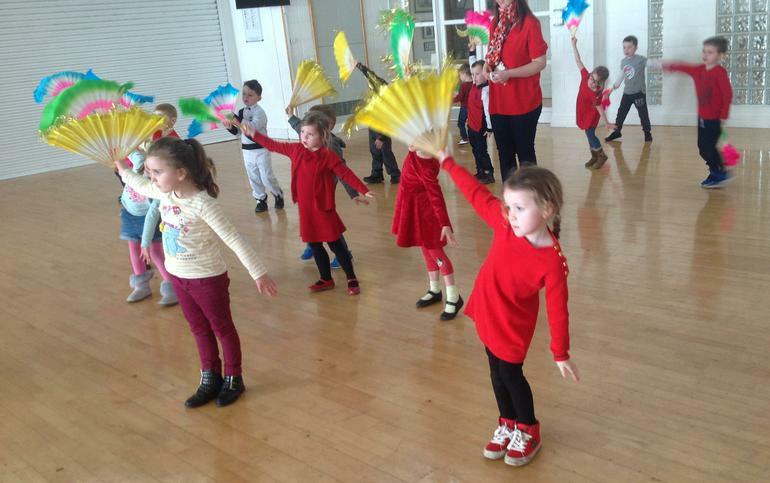 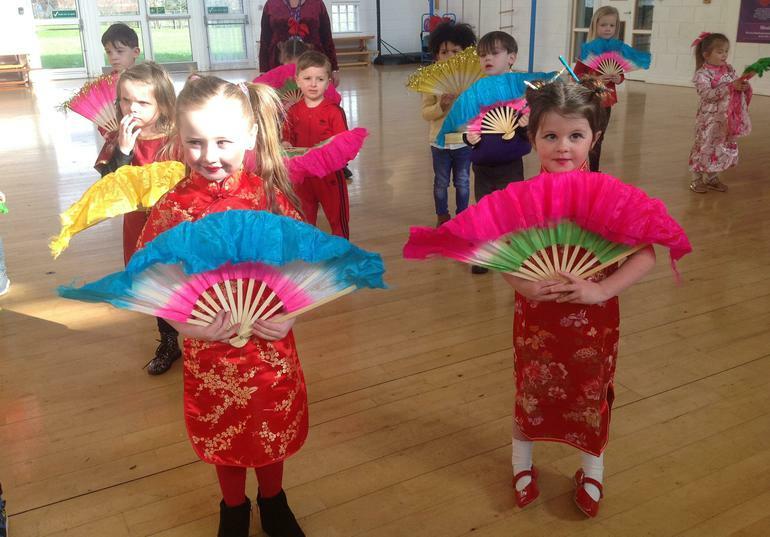 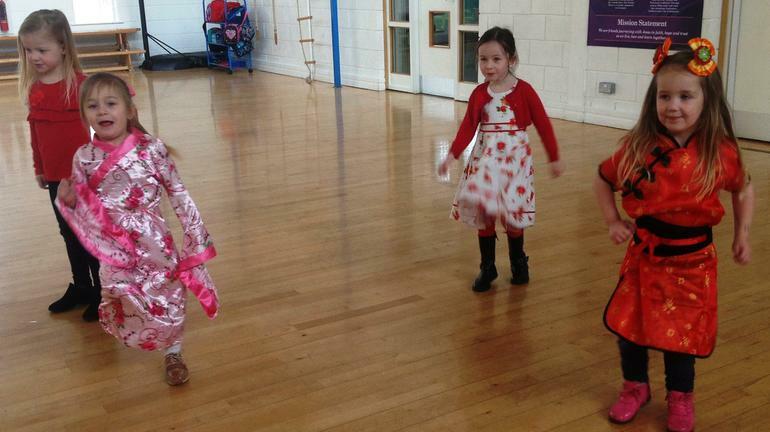 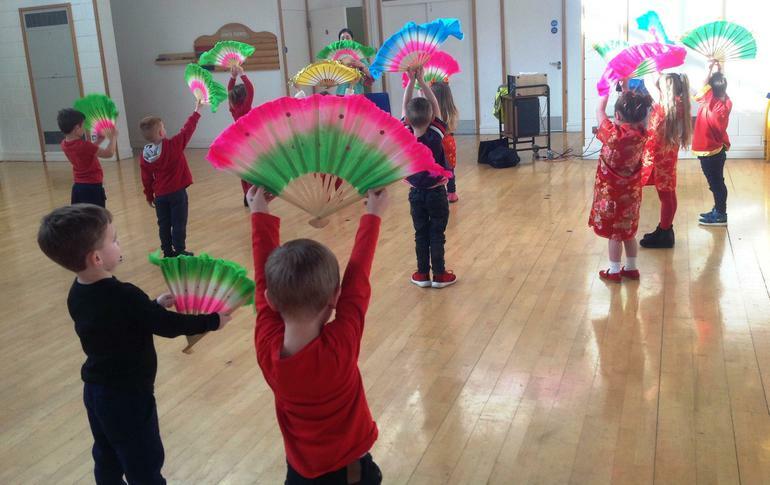 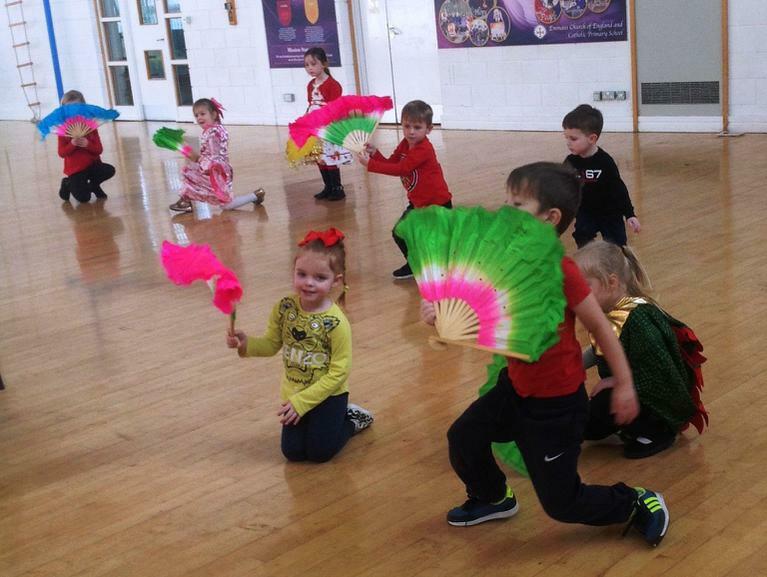 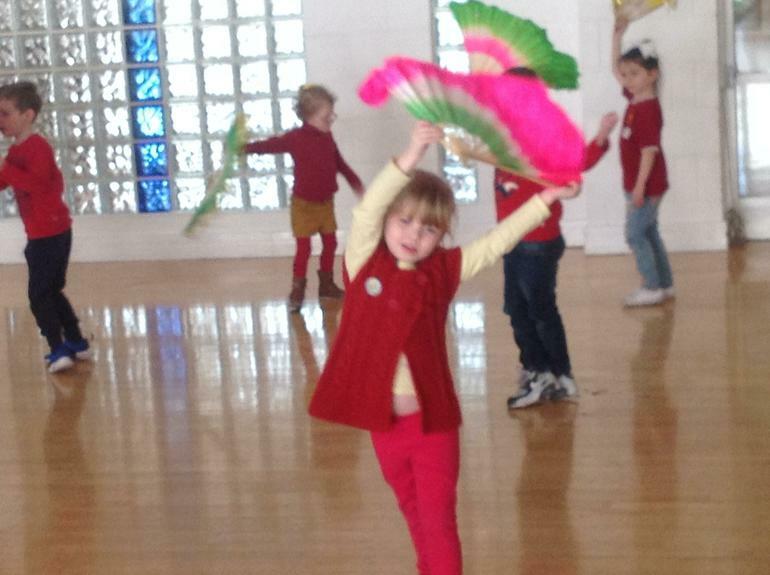 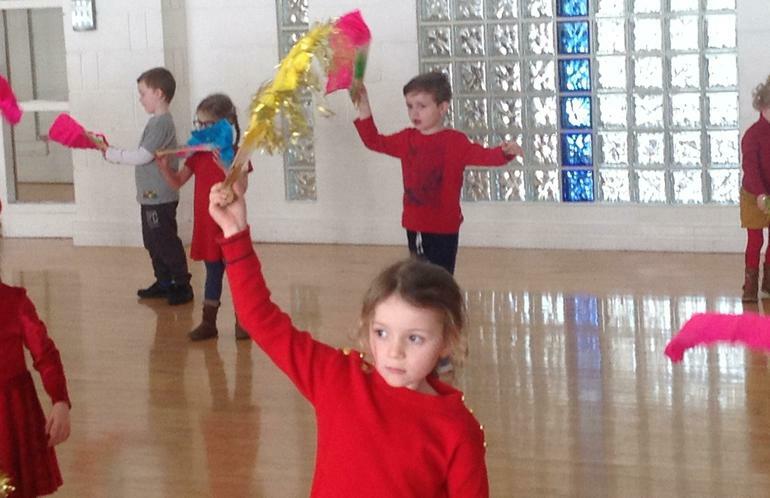 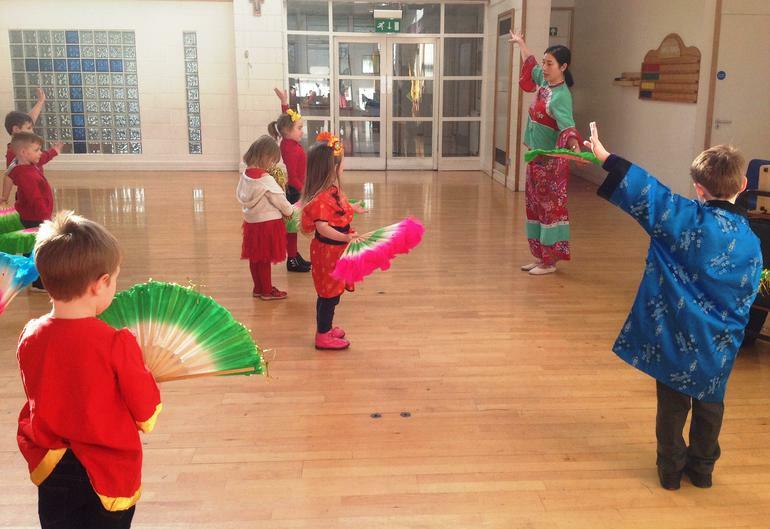 Making Chinese Lanterns, Dragons and Fans! 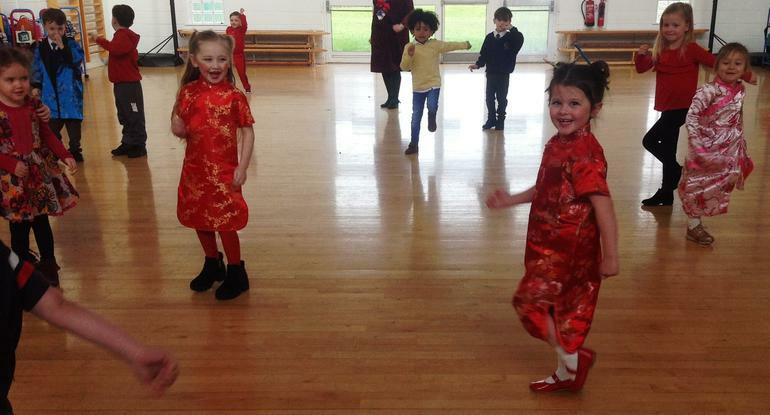 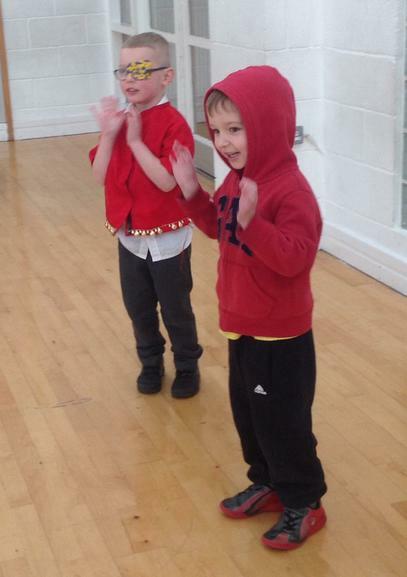 To end our week of festivities, we came to school on Friday, dressed in the colours of good luck (red) and good fortune (yellow). 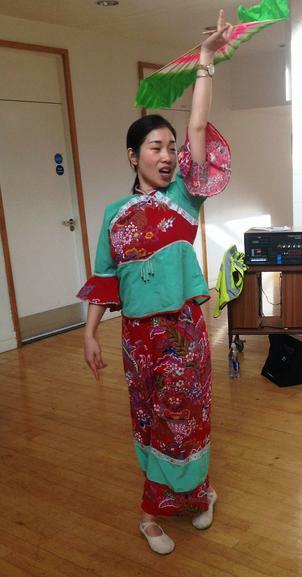 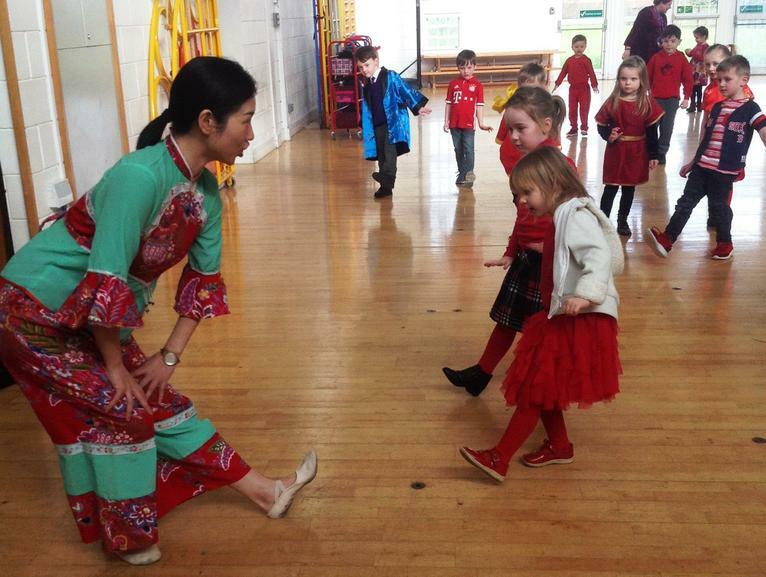 We were joined by our friend Fenfen Huang who spent the day with us to celebrate the ‘Year of the Dog’. 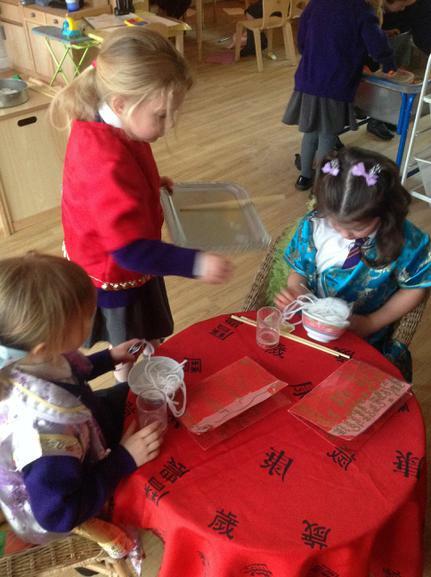 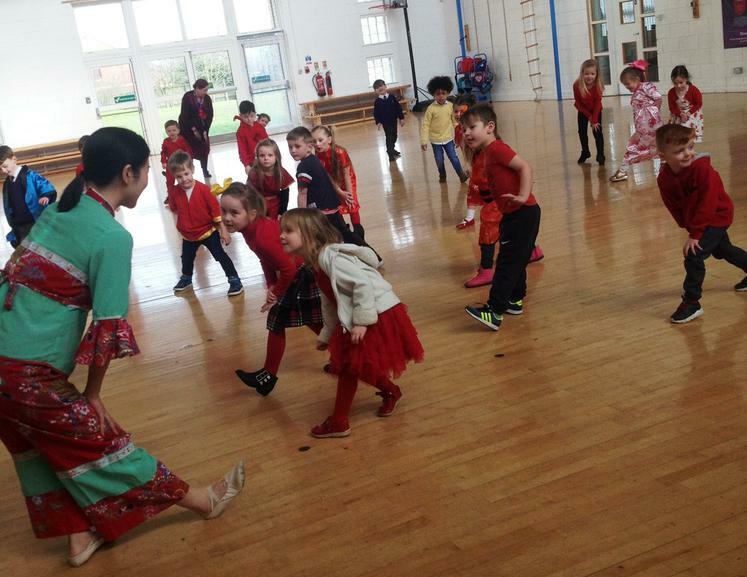 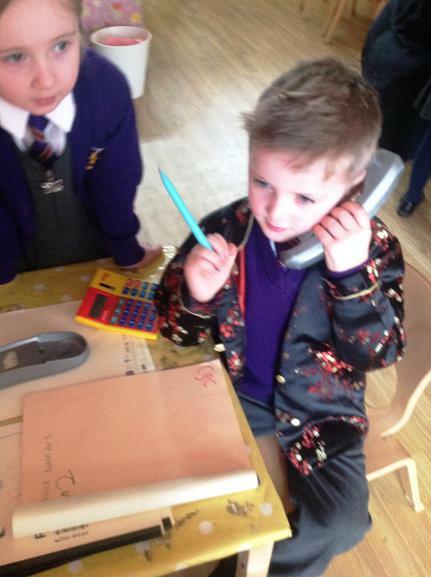 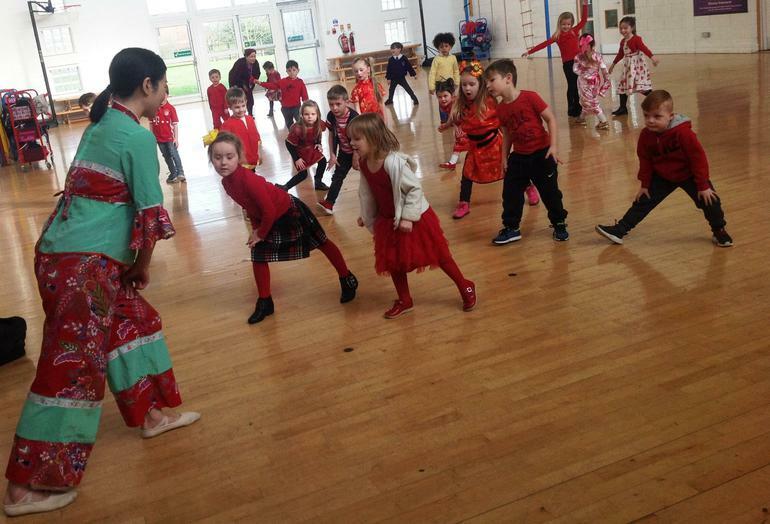 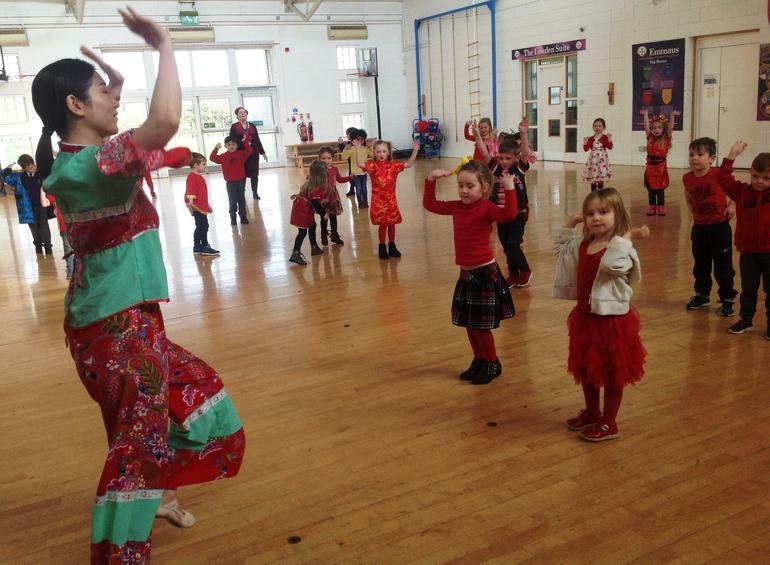 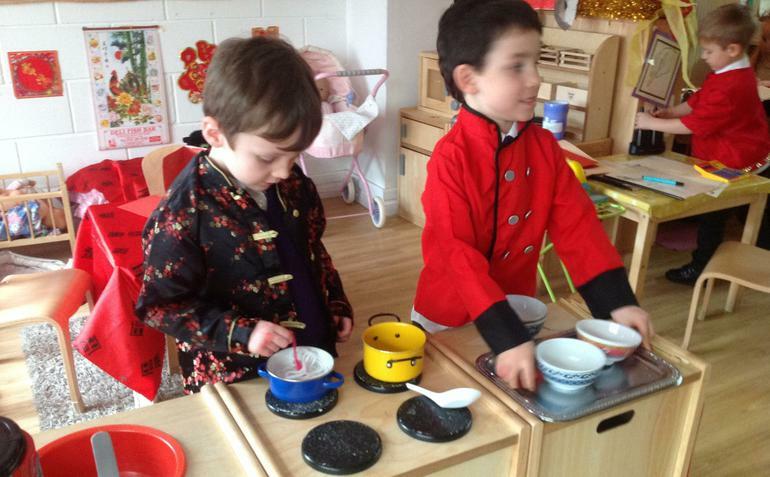 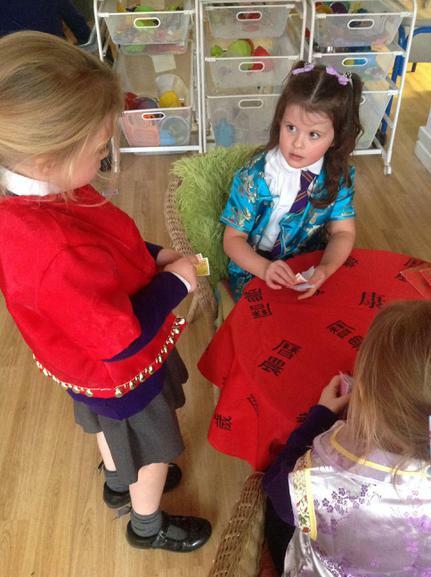 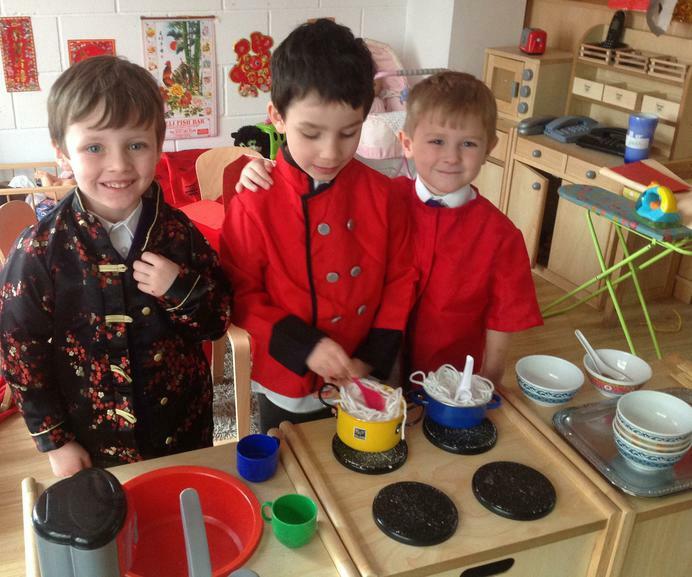 Fenfen talked to about how Chinese families celebrate this special festival, telling us some fascinating stories. 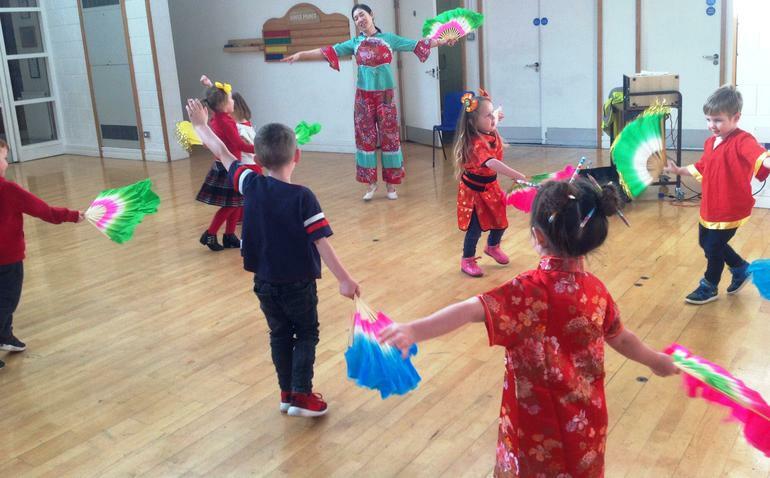 We all watched Fen Fen perform traditional Chinese dancing, then we all got the chance to dance with fans and ribbons to traditional Chinese music. 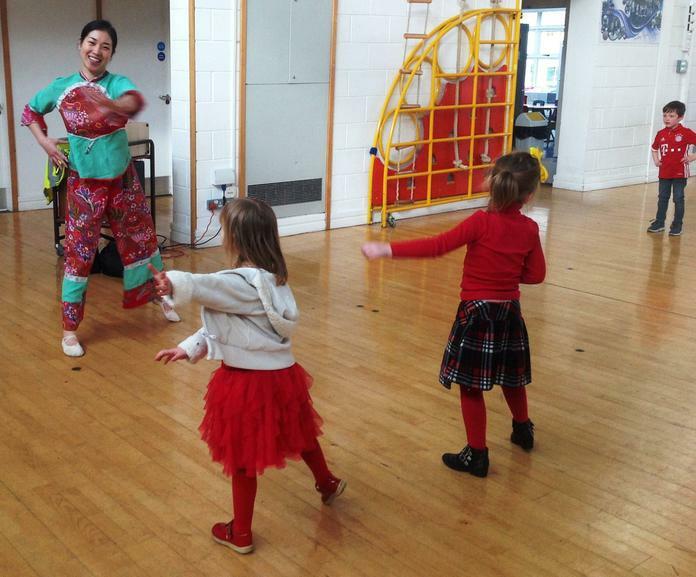 RK Fan Dancing with Fenfen!